Holidays always include decorations. The best decorations are ones that are handmade with love. 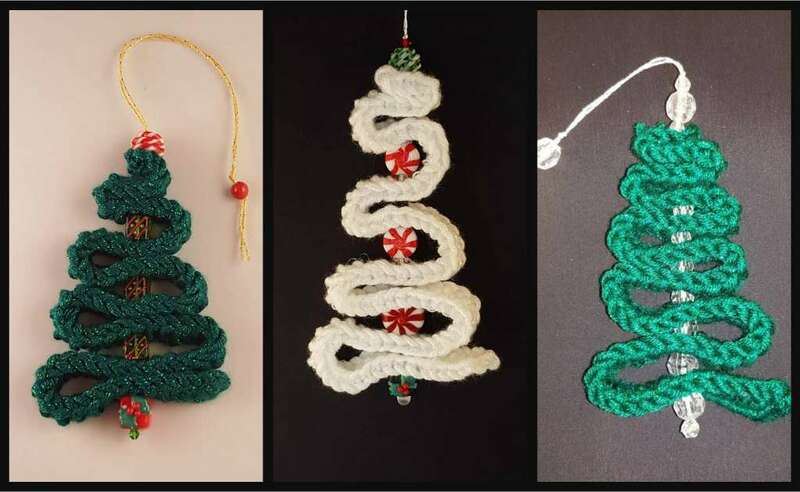 Deck the halls with this festive tree garland that is worked as one piece and goes on as long as you have time and patience to make it. 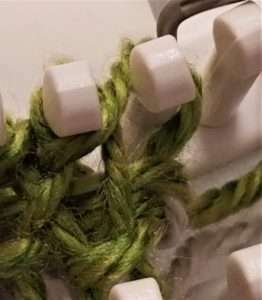 The connecting cord is worked on the outside loom while the trees are worked in double knit. 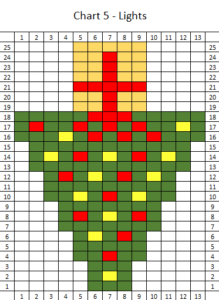 Five cheerful charts with skill levels ranging from beginner to medium depending on which chart is chosen is provided to pick and choose from to create your own holiday cheer. 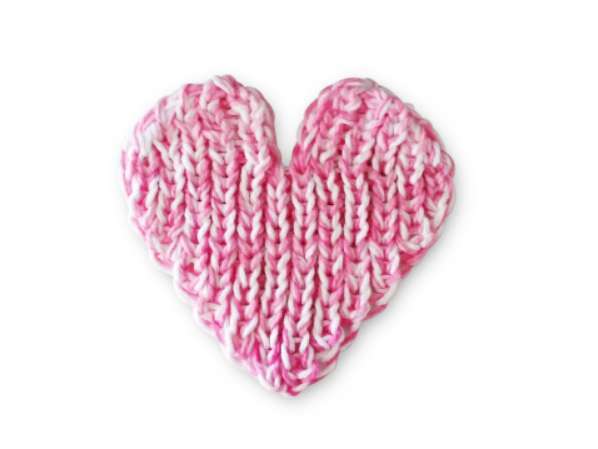 Use 1 strand of 4 worsted weight yarn. Use 2 strands together as 1 of 2 fine weight yarn. 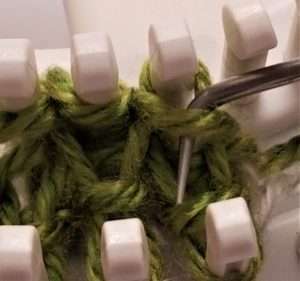 Always insert the crochet hook in the stitch in the same direction in order to keep the bind off from getting twisted. 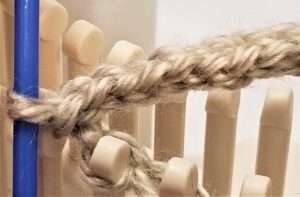 The chain is worked in single knit on the outside loom. 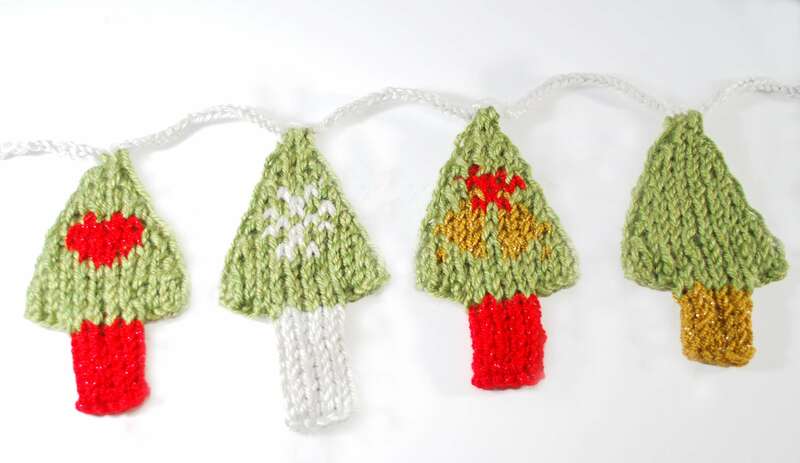 Trees are worked in double knit. Sample worked with 12 trees. Work as many or few trees with whichever charts desired. Read chart from bottom to top and from left to right. Work green in stockinette weave. 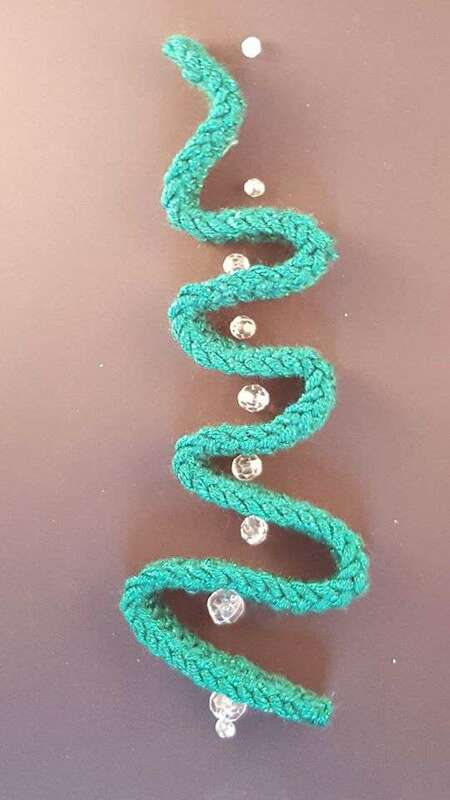 Work other colors in back to back weave unless the entire row is worked in the same color then work in SW.
Use ends to tie or otherwise secure garland. If longer cords are desired on each end, work more pegs for the cord at the beginning and end of the project. Tip: Print off charts. Mark off each row when worked for ease of reading. Leaving a 6″ tail, CO the outside loom in single knit with grey using the chain CO method for 25 pegs. Begin the chain cast on by placing the slip knot on the first peg. This picture is from the front of the loom. 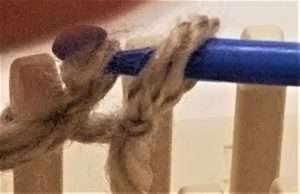 Bring the working yarn around back of the next peg. Wrap around the crochet hook and back around the front of the peg. 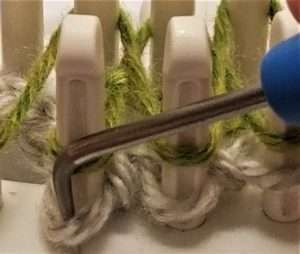 Wrap the working yarn around the hook. Pull the new loop through. This picture is from the back of the pegs being cast on. Pull the new loop behind the next peg. Bring the working yarn to the front of the peg. BO 15 pegs starting with the end stitch using the crochet BO method. 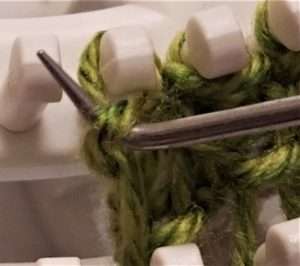 To bind off, place the loop from the first peg on the crochet hook. 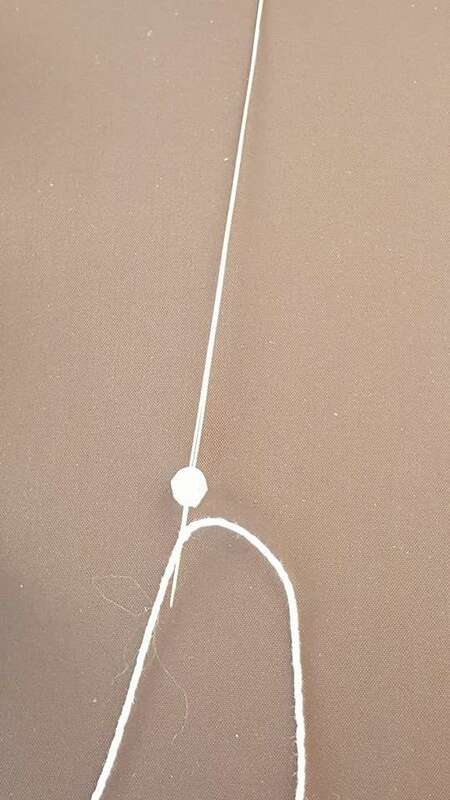 Place the loop from the next peg on the hook so there are 2 loops on the hook. Pull the second loop through the first loop. Repeat for each peg making a cord. place back on the peg. CO 3 sts with green in double knit SW over the next 3 peg. There will be 2 stitches on each peg on the outside rail and 1 stitch on each peg on the inside rail. Place slip knot on the first peg. Wrap with the SW for 3 pegs. Return wrap so pegs have wraps on the front and back pegs. Knit over the outside rail. 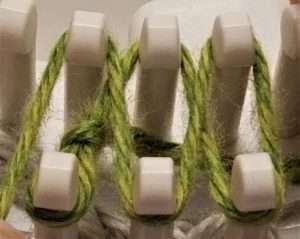 Wrap the 3 pegs in SW. Knit over both rails. Increase as follows when indicated on charts. First BO the next cord stitch leaving an empty peg between the double knit work and the cord stitches. Lift the loop from the previous stitch that is behind the peg. Move it over to the next empty peg. Increase the front peg in the same manner. Move stitch over to empty peg. Work the other side in the same manner on the back peg. And then the front peg. Place the new stitch on the next empty peg. Each increase is worked on both sides increasing the work by 2 stitches. Place the loops from the back pegs on the last 4 stitches on each end on the corresponding front pegs. Knit over so there are only 1 loop on each peg. BO using the crochet BO method starting the end stitch working to the middle. Repeat on the other side. 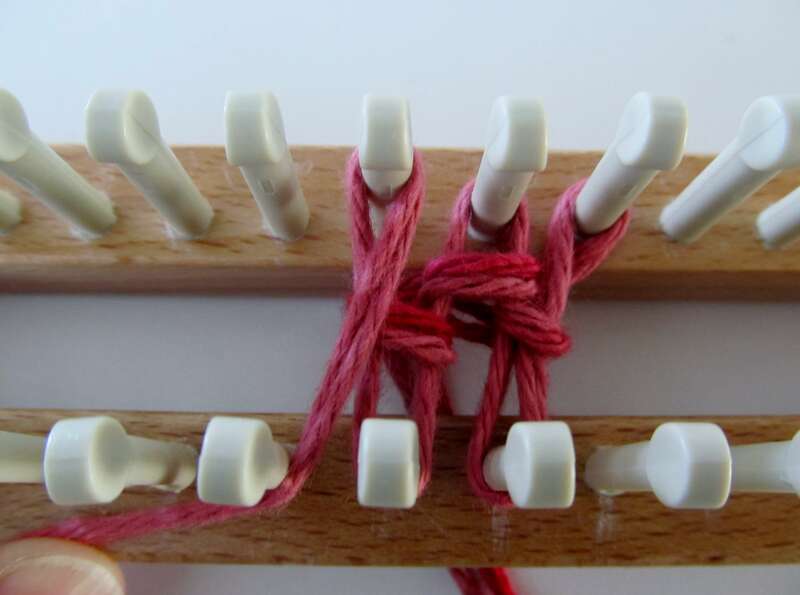 Place the loops from the back rail on the corresponding pegs on the front rail. Starting on the end opposite the working yarn, work the crochet BO method until all loops are off the pegs. 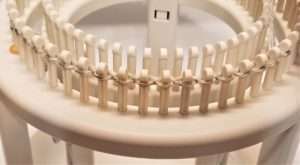 Pull the working yarn through the last loop to secure. *Work the cord by CO 23 more pegs, finish the cord by BO 15 pegs, then work the next tree. Continue by repeating from * until number of trees or width is achieved. Work the cord for 13 more stitches. Cut working yarn leaving a 6″ tail. Pull tail through last stitch to finish. im afraid it will all fall apart, when i make this.. In love with February and its promises of warm weather; the sun shines brighter, the afternoons get longer, and the specks of red surround us as a reminder of life! LOOM: Hat loom, 42 pegs at large gauge. SIZE: Fits youth, up to 19” head. K=Knit stitch (recommend the true knit stitch, not the ewrap). Assemble the knitting loom to 42, at large gauge. With MC, CO 42 sts, prepare to work in the rnd. Rnd 11: k to end of rnd. Rep Rnd 11: until item measures approx. 7” from CO edge. 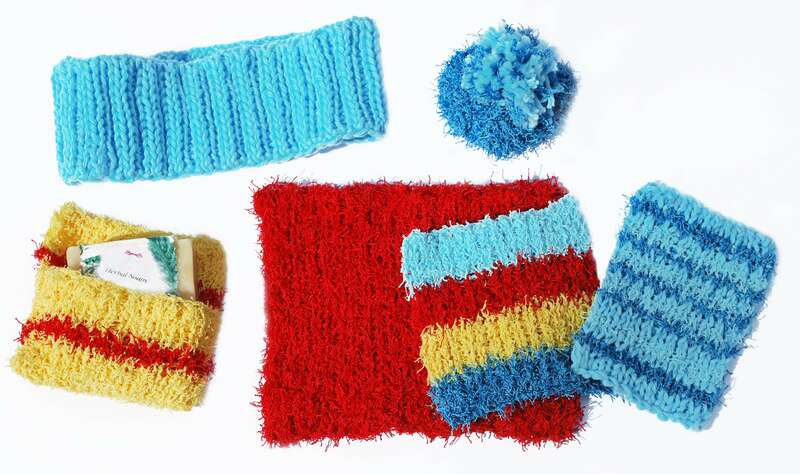 Remove all stitches from the knitting loom to a piece of scrap yarn. Using crochet hook, start bind off 2 sts at a time. 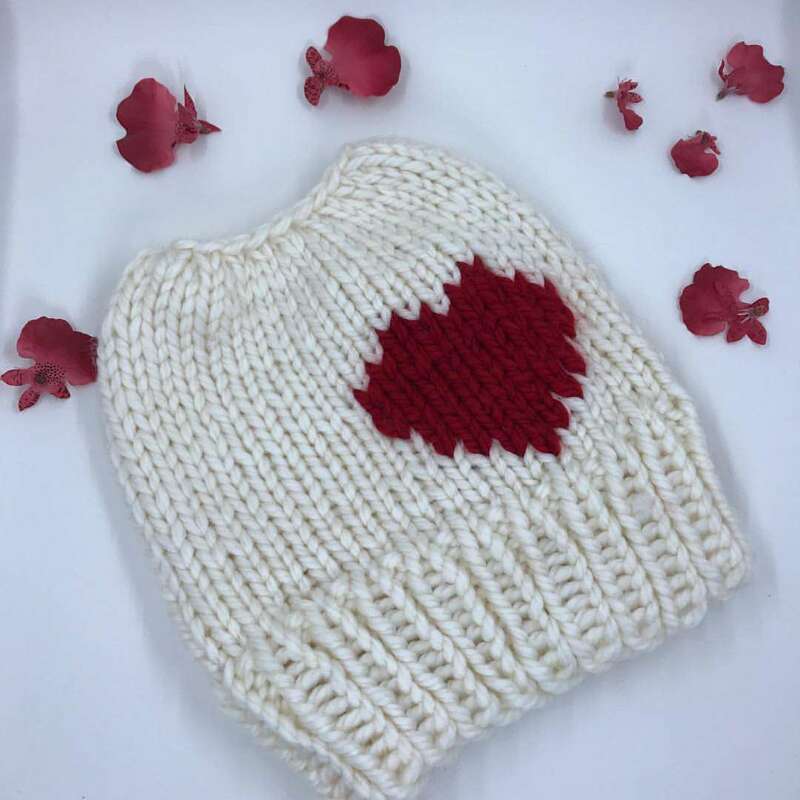 Using CC yarn and tapestry needle, use the duplicate stitch technique to place the heart motif on the hat. Weave in all ends. Gently tug on the hat vertically to set the stitches. Block lightly. 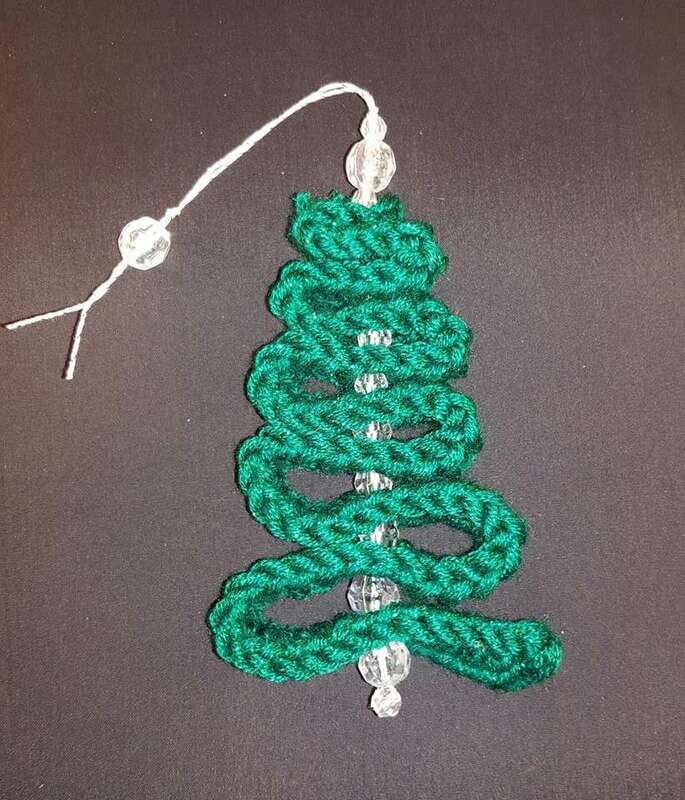 Loom Knitting Advent, day 25 brings you one last loom knitting surprise: Mister Quinzee, a fun little ‘snowman’ with a hollow core, perfect for storing a little bit of holly-jolly! A quinzee is a simple shelter made by hollowing out a pile of settled snow. It is simpler than an igloo, yet it is an effective way to stay warm if you are out in the winter elements for very long. The instructions for this project won’t help you create a winter shelter, but they will help you create an adorable snowman with a hollow ‘shelter’ for your favorite goodies or trinkets. Yarn: Hat: Red Heart Stellar in Celestial. Head: Bernat Baby Blanket in White. Notions: knitting tool, tapestry needle with large eye, scissors, 4” x 4” round paper mache box with lid, LaMode button set #2010, glue gun and hot glue, pencil, blush (optional). Pom-pom: Lay the yarn across the palm of your hand. Wrap the yarn around the hand about 20-25 times. Slide the wraps off of the hand, keeping them pinched together at the center. 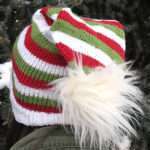 Take a separate length of yarn and tie it very tightly around the center of the pom-pom. Knot it securely. 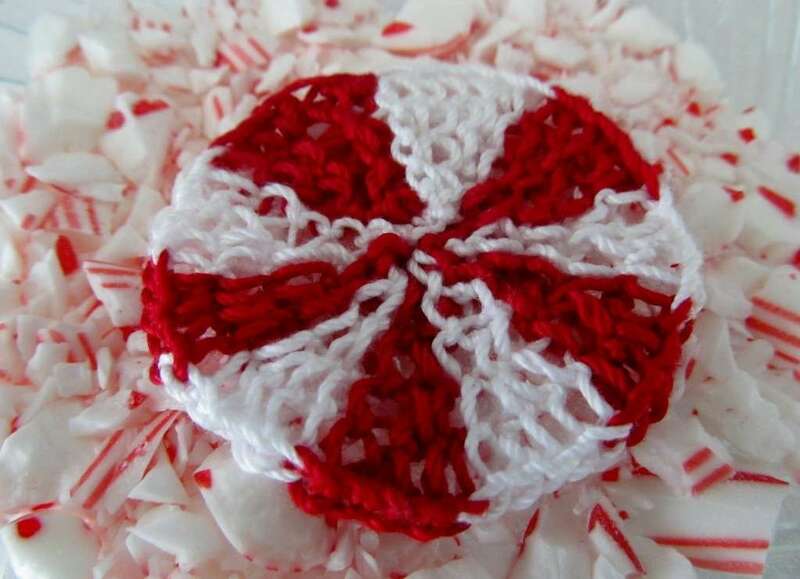 With scissors, cut the loops at each end of the pom-pom. 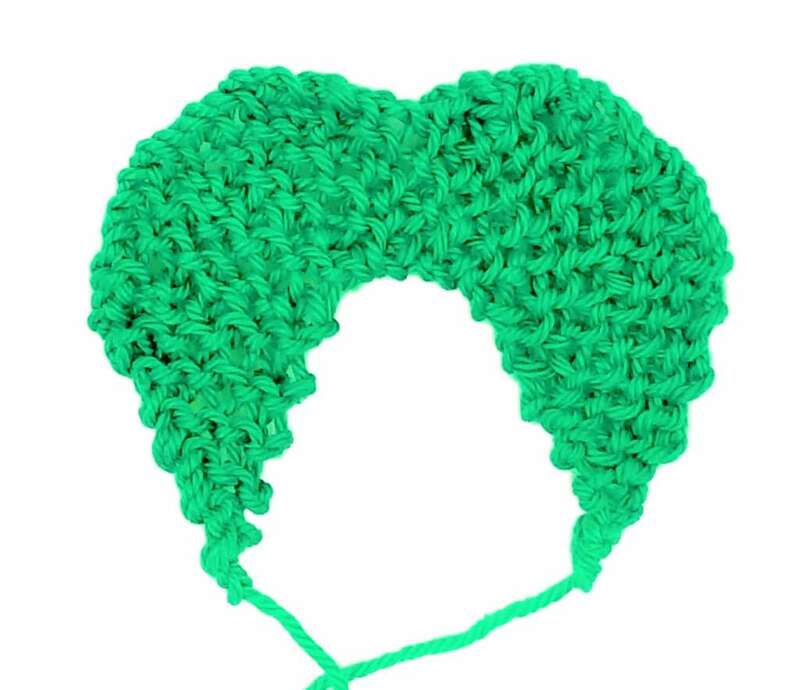 Be careful not to cut the center strand that holds the pom-pom together. 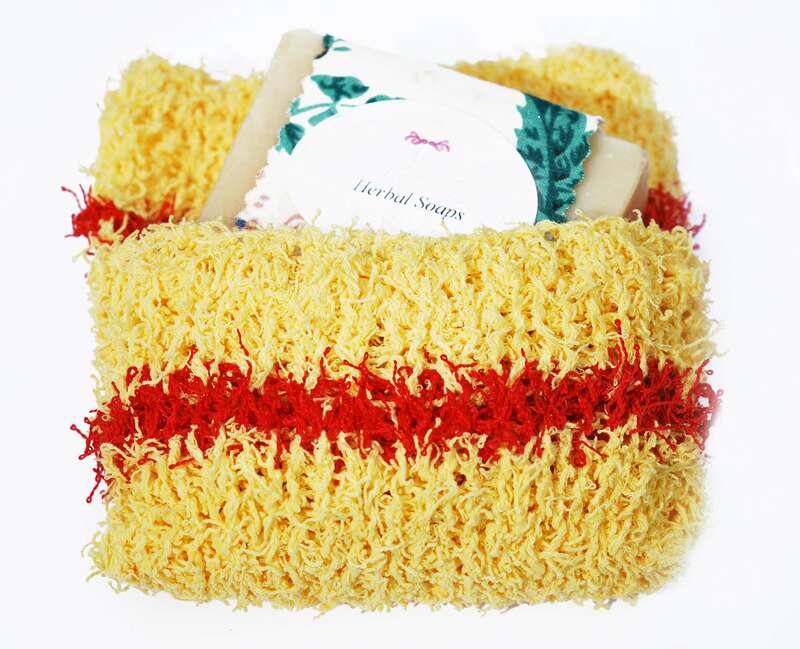 Fluff the pom-pom and trim any longer strands, if needed. 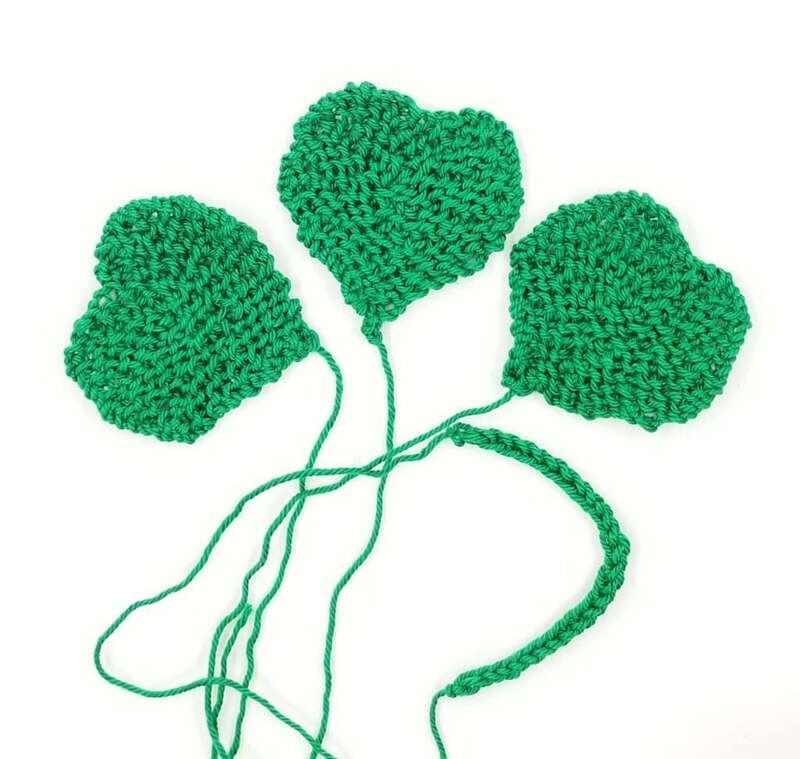 Use the yarn ends from the center tie to attach the pom-pom to the project. This set up is used throughout the project. You are now ready to begin knitting. With the Red Heart Stellar, cast on 28 stitches using the double e-wrap cast on method. Rounds 1-8: K2, P2 to the end of the round. Rounds 9-35: K to the end of the round. 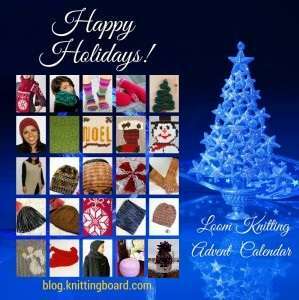 Remove the hat from the loom using the gathered bind off method. 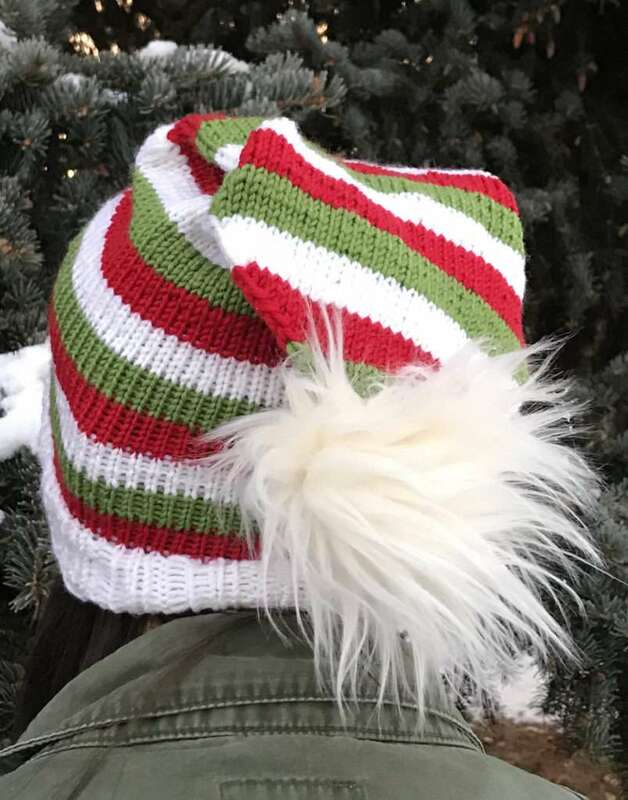 If desired, create a pom-pom and attach it to the top of the hat. Weave in all yarn ends. Set hat aside for now. With the Bernat Baby Blanket, cast on 28 stitches using the double e-wrap cast on method. Rounds 1-20: K to the end of the round. 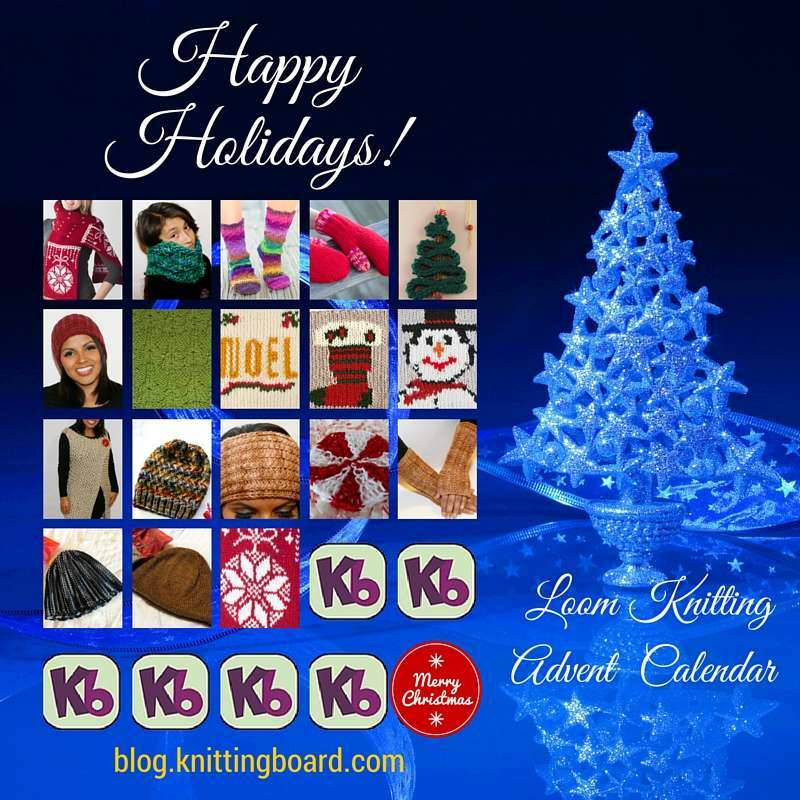 Remove the head from the loom using the basic bind off method. Weave in all yarn ends. Set head aside for now. 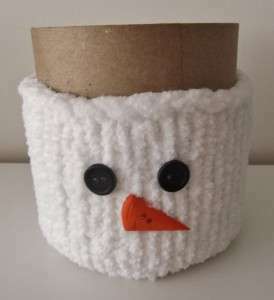 Plug in the hot glue gun and let it warm up. Pick up the round paper mache box. 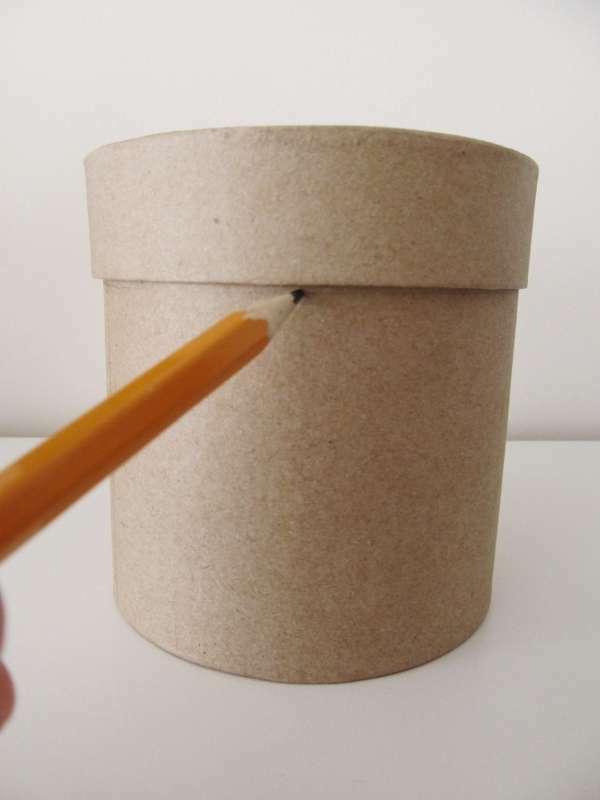 With the lid on the box, use the pencil to trace a line around the perimeter of the container, just below the lip of the lid. Remove the lid from the box and set it aside for a moment. Slip the knitted head piece onto the box, like a sleeve, lining the bind off edge up with the pencil line on the container. 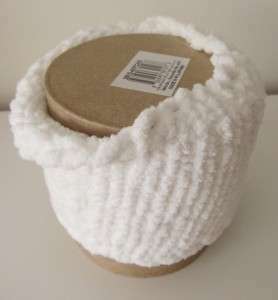 Using the hot glue gun, carefully glue the bind off edge of the knitted head sleeve to the paper mache box. Next, wrap the cast on edge of the knitted head sleeve down around the bottom of the container, gluing it in place with the glue gun. Add blush to Mister Quinzee’s face, if desired. Fill the paper mache box up with some sort of wonderful, then place the lid back on the container. 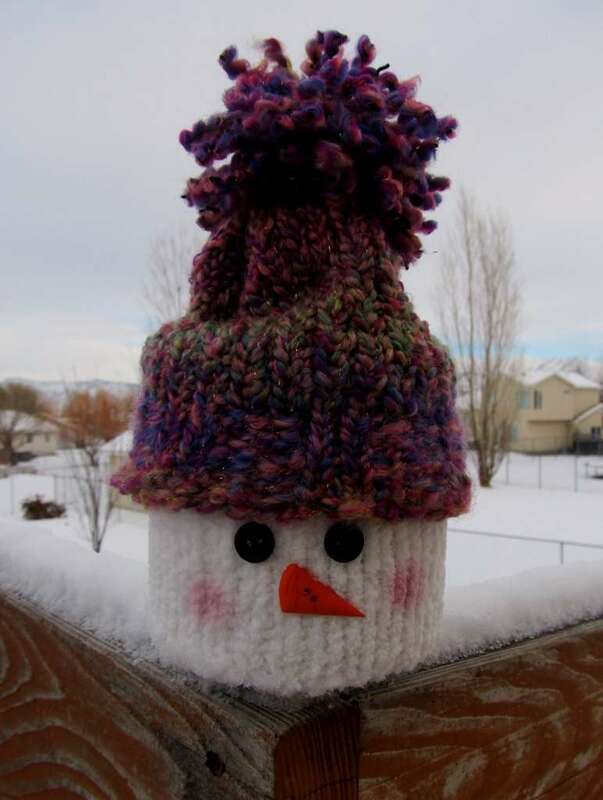 Slip the knitted hat on over the lid and pull it down until it rests just above Mister Quinzee’s eyes. So cute! Wishing much warmth and happiness to each of you this Winter! 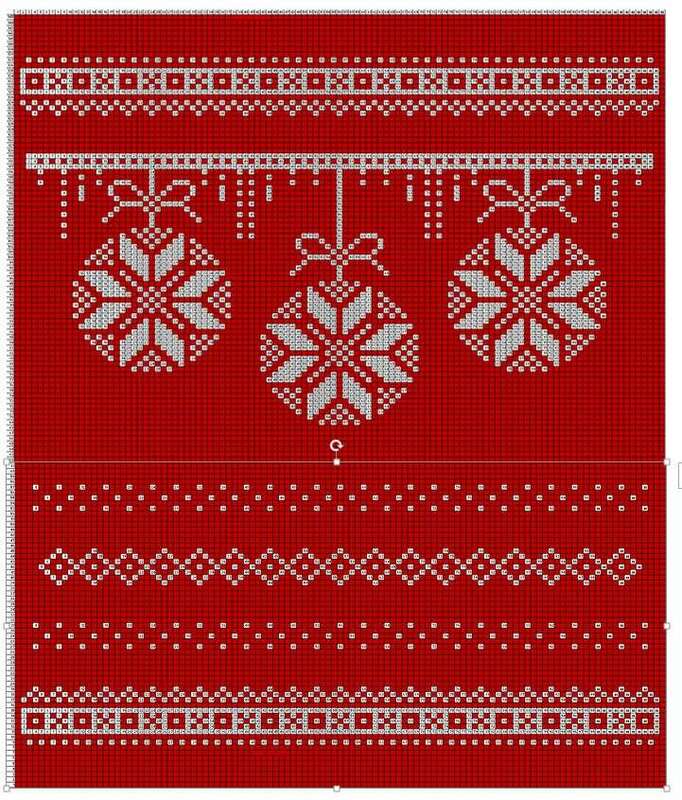 I would like to give a a great big applaud to all the designers of this 25 day advent calendar patterns Fantastic job on all the selections used in this project. What a cutie, Jenny!! That face is simply adorable! I’m going through pattern withdrawal! 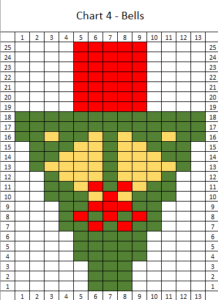 I loved the advent patterns!!! Thank you for providing them!!!!!!! I just wanted to say what a cute pattern and idea to make where you can place homemade cookies or fudge,candies to gift to friends they can eat th goodies then after finished they can use the knitted container for decoration to set out every Christmas and you could use the container and knitted holiday slevees and make like a pumpkin or Turkery , easter bunny, valetine , fourth of July or a birthday cake sleeves for all the different holidays just use our imaginations this would be a awesome gift to share with friends and family love the 25 days of Advent calendar knitted patterns Thank you to all of you came up with all these great knitted patterns . 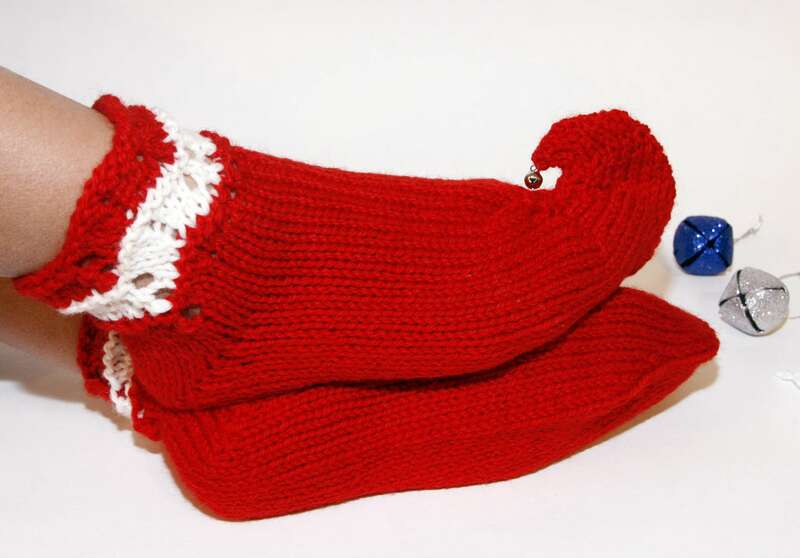 Loom Knitting Advent, day 22, brings you a whimsical pair of Elf slippers. Yarn: Approx 150 yards of worsted weight wool. Patons Classic Wool worsted in Bright Red and White was used in sample. Notions: knitting tool, tapestry needle, row counter (optional). Size: Shown fits a size 5-9 US women. ssk= A left slanting decrease. Takes place over 2 pegs. Number the pegs 1 and 2, from right to left, as follows: Peg 2 -Peg 1. 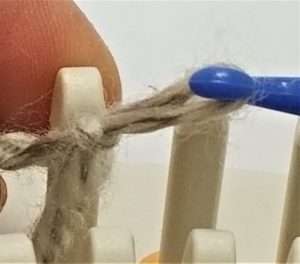 Remove stitch from peg 2 and place it on peg 1. Work both loops together as one loop. YO=Yarn over. Created by ewraping the empty peg. Used to create the opening for lace items–it creates a small hole. 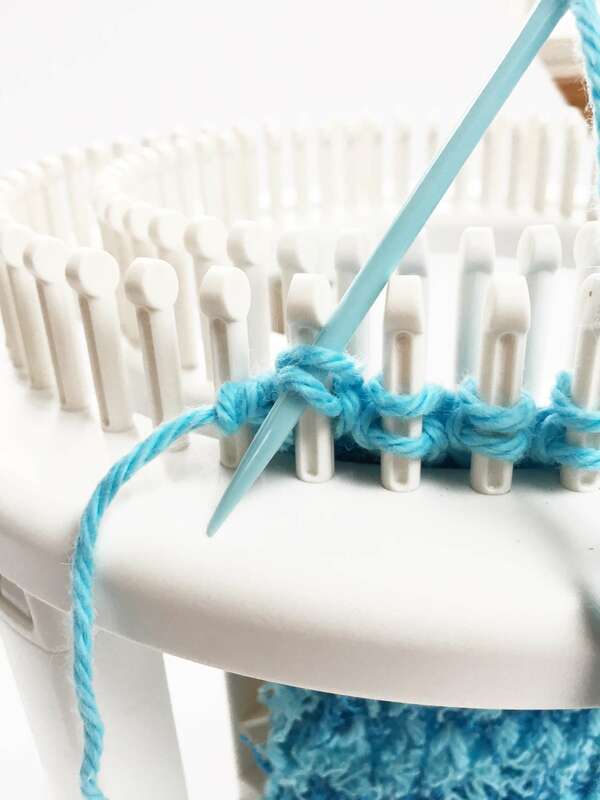 Note: On the next row, untwist the ewrap and place this strand of yarn in front of the peg, then work the peg as instructed (either purl it or knit it). Using MC, cast on 36 sts, prepare to work in the rnd. Set up rnd: p to the end of rnd. Rnd 1: k to the end of rnd. Rnd 2: *yo, k2, ssk, k2tog, k2, yo, k1; rep from * to end of rnd. 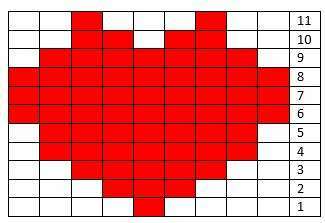 (It is a 9 st pattern repeat). Step 1: Remove loop from peg 4 and hold it, move loop from peg 3 to peg 4. Place loop that you are holding back on peg 4. Step 2: Move loop from peg 2 to peg 3. Step 3: Move loop from peg 1 to peg 2. Step 4: Move loop from peg 6 to peg 5. Step 5: Move loop from peg 7 to peg 6. Step 6: Move loop from peg 8 to peg 7. Step 7: Ewrap peg 1, knit peg 2-7 (treating the pegs that have two loops as one loop), ewrap peg 8, knit peg 9. 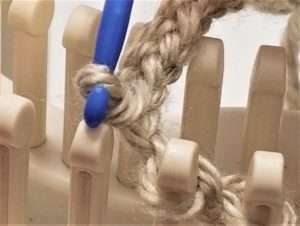 On Rnd 1: undo the ewraps on pegs 1 and 8, placing this piece of yarn in front of the peg. Then proceed to knit the rnd. **Next rnd: k to the end of rnd. Next rnd: p to the end of rnd. Next rnd: k to the end of rnd. Rep last rnd until item measures 2 inches less than desired foot length. (Sample shown has 30 rnds). Cut yarn leaving a 15 inch yarn tail***. Join yarn at peg 28. Peg 28 will become peg 1 from this point forward. 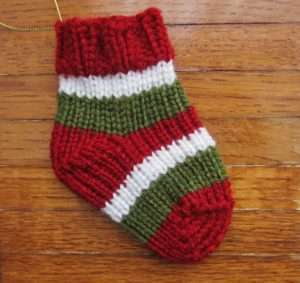 The toe is shaped with both short rows and with decreases. Tip: Recommend to move the stitches first to create the decreases. Next 2 rows: k to the end of row. Next row: k1, k2tog, k to the last 3 sts, k2tog, k1 (34 sts rem). Next row: k1, k2tog, k to the last 3 sts, k2tog, k1 (32 sts rem). Next row: k14, (k2tog)2x, k12, w&t. Next row: k11, (k2tog)2x, k10, w&t. Next row: k9, (k2tog)2x, k8, w&t. Next row: k7, (k2tog)2x, k6, w&t. Next row: k to the end, picking up all the wraps. Next row: k5, (k2tog)2x, k4, w&t. Next row: k8, (k2tog)2x, k6, w&t. Next row: k3, (k2tog)2x, k2, w&t. Next row: k1, (k2tog)2x, w&t. Next row: k4, (k2tog)2x, k2, w&t. Next row: k2, (k2tog)2x, k2. Next row: k1 (k2tog)2x, k1. Bind off. Cut yarn leaving a 6-inch yarn tail. Weave this end in. Using the yarn tail from the opening, mattress stitch seam the toe close. 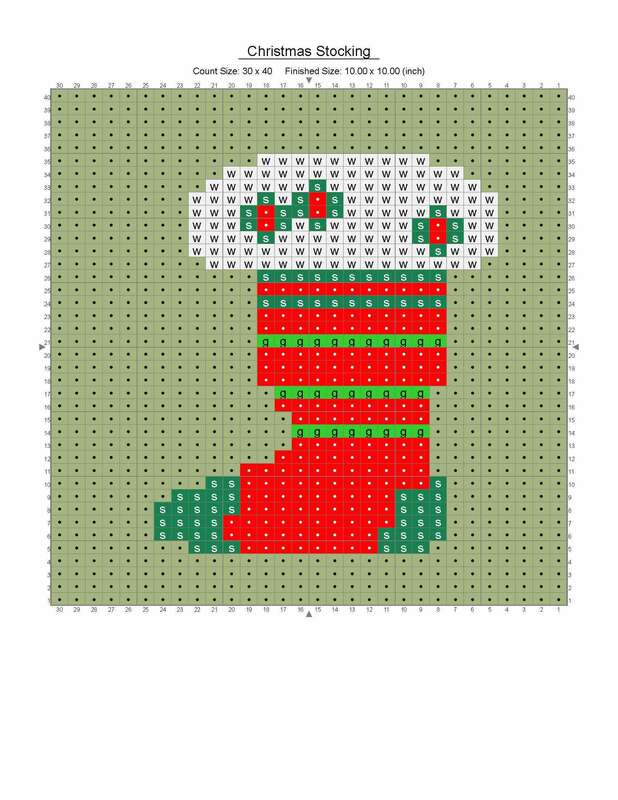 Optional: Add a decorative bell to the tip of the Elf House Slipper. Loom Knitting Advent, day 21, brings you a lovely double knit square with an intarsia motif. 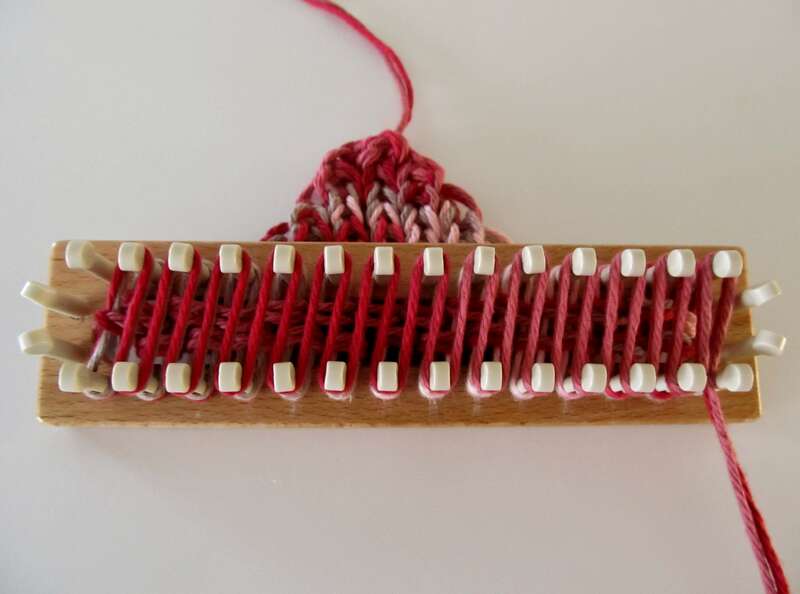 Loom: All-n-One Loom set up for double knit with 1 cm spacing. Yarn: Paton’s Classic Wool, 100% wool, 120 yds per skein. Hand wash and lay flat to dry. Colors used are white (W) and Gold (G). Background is Natural, or Blue in Lions Brand Alpine Wool in BayLeaf. Both yarns are 100% wool #5 with great color assortments. Dark Spruce green also works well. This will be noted as (B) yarn in pattern for ‘background’. 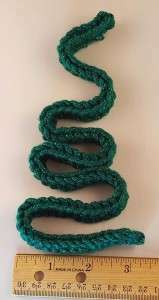 One skein of (B) and 1/2 skein of (W), and small amount of (G). You may want to add a piece of painters tape on the board near you and note the number of each peg. This will really make it easier than counting pegs each row. Also, the graph is explained in the following instructions working from left to right. You may want to re-number your graph on paper, so print it out before you begin. Cast On 30 stitches in Stockinette, (B) yarn. Rows 1-3: Work in stockinette stitch. Row 4: Tie on (W) yarn at peg #16. Work pegs # 16-20 in stockinette. Lay yarn down. Go back to start of row and weave in stockinette on all pegs with (B), skipping the pegs with (W) yarn. Hook over all. Rows 5-24: All these rows will be a combination of the (B) and the (W) yarn worked in stockinette. Work the (W) first on designated pegs. 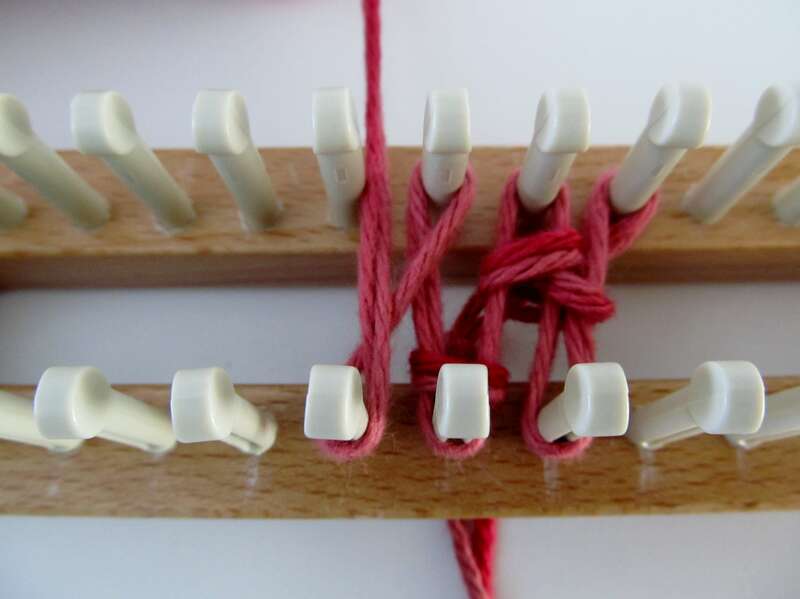 Then cover the rest of the pegs with the (B) yarn. Hook over. The pegs to be wrapped with (W), by row, are as follows. Row 25: Tie on (G) yarn at peg #5 and wrap pegs 5 and 6, front to back. Lay down yarn. Wrap in stockinette with (W) yarn, peg 9, and 14-15, and pegs 18-23. Complete row with (B) yarn. Row 26: Pegs 4-12 with (G) yarn, front to back. Pick up (W) yarn and work in stockinette on pegs 13-15, and pegs 18-23. Complete row with (B) yarn. Row 27: Pegs 5-6, and peg 28 with (G), peg 9, and pegs 13-16, and pegs 19-23 with (W) yarn. Complete row with (B) yarn. Row 28: Pegs 28-29 with (G) yarn. Pegs 12-16, and pegs 21-22 with (W) yarn. Complete row with (B) yarn. Row 29: Peg 28 with (G) yarn. Pegs 12-16 with (W) yarn. Complete row with (B) yarn. Row 30: Pegs 12-16 with (W) yar n.
Row 31: Pegs 13-15 with (W) yarn. Row 32-40: These rows will be (B) yarn except for a series of (G) stars. 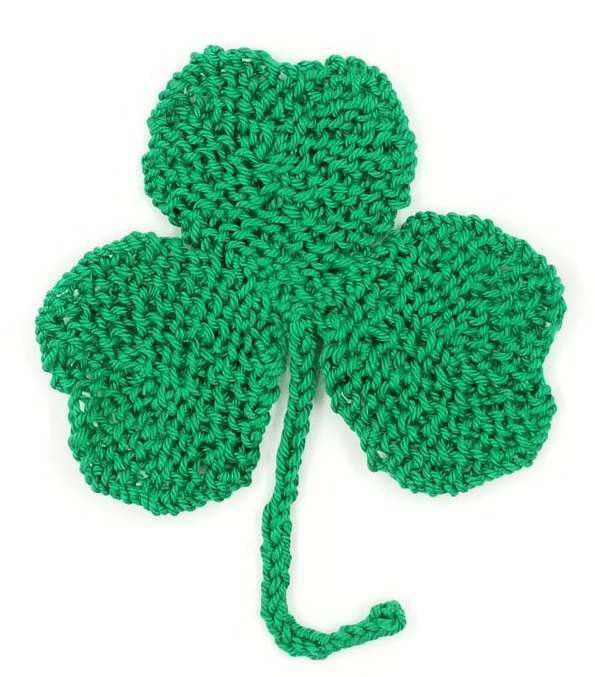 Each star consists of 4 stitches each, one stitch, and 3 stitches in next row, and then last stitch in next row. See graph. You can add as many of these stars in (G) yarn as desired. 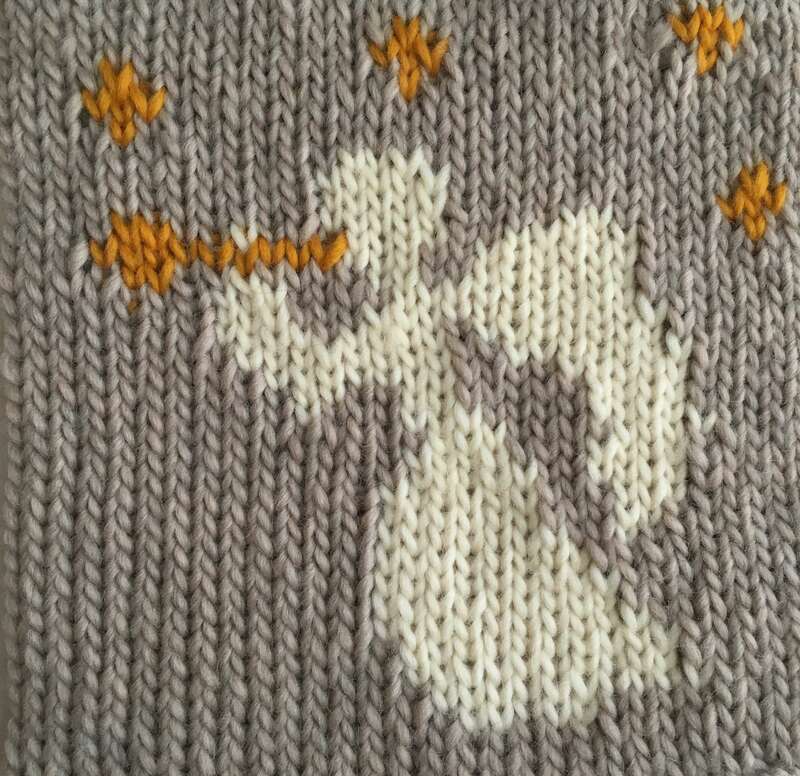 The Christmas Angel will love lots of bright stars. Bind off after row 40 is complete with the 2-loop method. Finish the anchor yarn edge the same and remove the anchor yarn. Lightly mist and block the square. It can be added to your other squares or used alone. Loom Knitting Advent, Day 18, brings you a lovely double knit afghan. Enhance your home during the holidays with this classic wool throw destined to become a family heirloom. 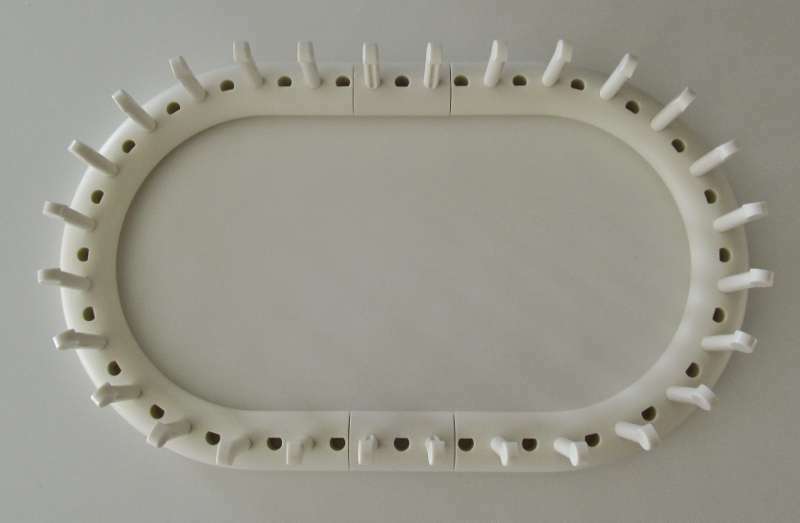 Loom: 38” Knitting Board set for double knit with .5” spacer setting. Yarn: Knit Picks Wool of the Andes Superwash Bulky, 100% Superwash Wool. 137 yards per skein. Hand wash in cold water and lay flat to dry. Colors: Hollyberry (R) 9 skeins, White (W), 2 skeins. Notions: Knit hook, crochet hook, large darning needle. Abbreviations: (R)= Hollyberry Red yarn. 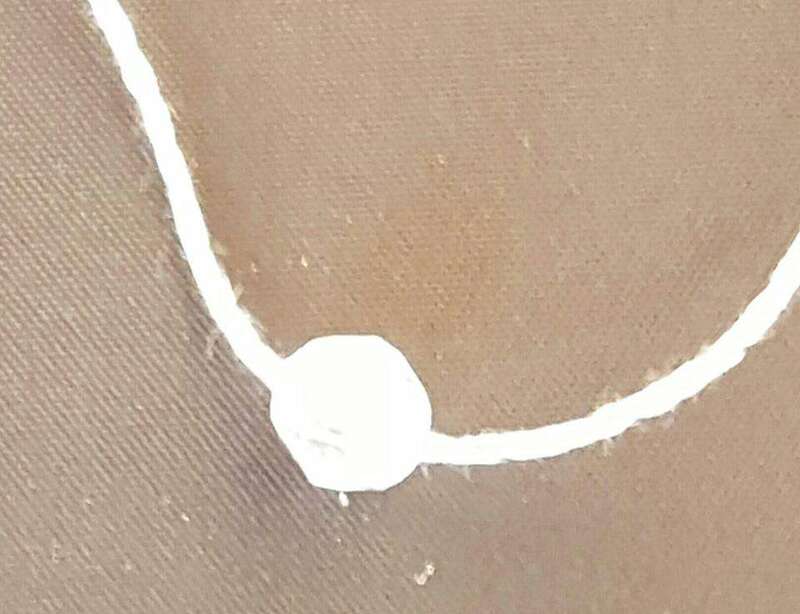 (W)= White yarn. Back to back weave: single pass of the loom. Basic wrap around back peg of stitch and then carry the yarn straight down to lower peg of same stitch. This can be done for just a single stitch or several. Cast on 111 stitches with (R) in stockinette stitch. Lay contrasting anchor yarn. Row 1: Work row in (R) in stockinette. Rows 2 – 7: Work in (R) in rib stitch. Note: Rows 8 – 138 are all in stockinette stitch unless noted for basic weave. Row 8: Work row in (R) in stockinette. Row 9: Tie on (W) yarn and work in stockinette on stitches 3-109. Wrap the rest of the pegs in (R) yarn basic weave, and hook over. Row 10: Work row in (R) yarn. Carry (W) yarn through. Row 11: Work (W) on rows 2 – 110. Wrap basic weave on pin 1 and then loosely to 111 with (R) yarn. Row 12: Work (W) yarn on pins 2, 6, 8,10, 14, 16, 18, 22, 24,26, 30, 32, 34, 38, 40 42, 46, 48, 50, 54, 56, 58, 62, 64, 66, 70, 72, 74, 78, 80 82, 86, 88, 90, 94, 96, 102, 104, 106, and 110. Wrap remaining pins in (R) yarn, basic. Row 13: Wrap (W) yarn on pins 2, 4, 6, 7, 9, 10, 12, 14, 15, 17, 18, 20, 22, 23, 25, 26, 28, 30, 31, 33, 34, 36, 38, 39, 41,42, 44, 46, 47, 49, 50, 52, 54, 55, 57, 58, 60, 62, 63, 65, 66, 68, 70, 71, 73, 74, 76, 78, 79, 81, 82, 84, 86, 87, 89, 90, 92, 94, 95, 97, 98, 100, 102, 103, 105, 106, 108, 110. Wrap remaining pins in (R) yarn, basic. Row 16: Work one row in (R) yarn. Row 17: Wrap even-numbered pins from 2 – 110 in (W) yarn. Wrap remaining pins in (R) yarn. Row 18: Wrap odd-numbered pins in (W) yarn from 3 to 109. Wrap remaining pins in (R) yarn. Row 19: Wrap (W) yarn on pins 4, 8, 12, 16, 20, 24, 28, 32, 36, 40, 44, 48, 52, 56, 60, 64, 68, 72, 76, 80, 84, 88, 92, 96, 100, 104. Wrap remaining pins in (R) yarn. Cut and knot (W) yarn. 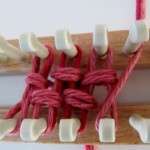 Rows 20 – 26: Work in (R) yarn. Row 27: Tie on (W) yarn and wrap 4, 8, 12, 16, 20, 24, 28, 32, 36, 40, 44, 48, 52, 56, 60, 64, 68, 72, 76, 80, 84, 88, 92, 96, 100, 104. Wrap remaining pins in (R) yarn. Row 28: Work row in (R) yarn. Row 29: Wrap (W) yarn on pins 6, 10, 14, 18, 22, 26, 30, 34, 38, 42, 46, 50, 54, 58, 62, 66, 70, 74, 78, 82, 86, 90, 94, 98, 102 and 106. Wrap remaining pins in (R) yarn. Row 30: Work row in (R) yarn. Row 31: Repeat Row 27. Cut and knot (W) yarn. 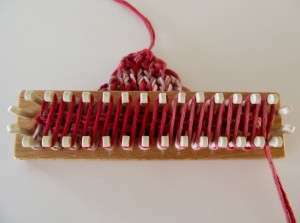 Rows 32 – 38: Work in (R) yarn. Row 39: Wrap (W) on pins 8, 14, 20, 26, 32, 38, 44, 50, 56, 62, 68, 74, 80, 86, 92, 98 and 106. Wrap remaining pins in (R) yarn. Row 40: Wrap (W) on pins 7, 9, 13, 15, 19, 21, 25, 27, 31, 33, 37, 39, 43, 45, 49, 51, 55, 57, 61, 63, 67, 69 73, 75, 79, 81, 85, 87, 91, 93, 97, 99, 103, and 105. Wrap remaining pins in (R) yarn. Row 41: Wrap (W) on pins 6, 10, 12, 16, 18, 22, 24, 28, 30, 34, 36, 40, 42, 46, 48, 52, 54, 58, 60, 64, 66, 70, 72, 76, 78, 82, 84, 88, 90, 94, 96, 100, 102, and 106. Wrap remaining pins in (R) yarn. Row 42: Wrap (W) on pins 5, 8, 11, 14, 17, 20, 23, 26, 29, 32, 35, 38, 41, 44, 47, 50, 53, 56, 59, 62, 65, 68, 71, 74, 77, 80, 83, 86, 89, 92, 95, 98, 101, 104, and 107. Wrap remaining pins in (R) yarn. Row 45: Repeat Row 39. Cut and tie off (W) Yarn. Rows 46-52: Work in (R) yarn. Rows 53 – 57: Repeat rows 27 – 31. Rows 58 – 68: Work in (R) yarn. Row 69: Wrap (W) on pins 53, 55, 57, and 59. Wrap remaining pins in (R) yarn. Row 70: Wrap (W) on pins 51, 54, 56, and 58. Wrap remaining pins in (R) yarn. Row 71: Wrap (W) on pins 49, 51, 52, 55, 57, 60, 61 and 63. Wrap remaining pins in (R) yarn. Row 72: Wrap (W) on pins 48, 51, 52, 53, 56, 59, 60, 61 and 64. Wrap remaining pins in (R) yarn. Row 73: Wrap (W) on pins 47, 49, 51–54, 58-61, 63, and 65. Wrap remaining pins in (R) yarn. Row 74: Wrap (W) on pins 46, 48, 51- 55, 57-61, 64, and 66. Wrap remaining pins in (R) yarn. Row 75: Wrap (W) on pins 45, 47, 49, 52- 55, 57, 58-60, 63, 65, and 67. Wrap remaining pins in (R) yarn. Row 76: Wrap (W) on pins 53-55 and 57-59. Wrap remaining pins in (R) yarn. Row 77: Wrap (W) on pins 44-48, 51, 54, 55, 57, 58, 61, and 64 – 68. Wrap remaining pins in (R) yarn. Row 78: Wrap (W) on pins 45-49, 52, 55, 57, 60, and 63 – 67. Wrap remaining pins in (R) yarn. Row 79: Wrap (W) on pins 21,23, 25, 27, 43, 46-50, 53, 59, 62-66, 69, 85, 87, 89 and 91. Wrap remaining pins in (R) yarn. Row 80: Wrap (W) on pins 19, 22, 24, 26, 29, 44, 47-51, 54, 56, 58, 61-65, 68, 83, 86, 88, 90 and 93. Wrap remaining pins in (R) yarn. Row 81: Wrap (W) on pins 17, 19, 20, 23, 25, 28, 29, 31, 43, 45, 48-52, 55, 57, 60-64, 67, 69, 81, 83, 84, 87, 89, 92, 93, and 95. Wrap remaining pins in (R) yarn. Row 82: Wrap (W) on pins 16, 19-21, 24, 27-29, 32, 44, 46, 54, 56, 58, 66, 68, 80, 83-85, 88, 91-93, and 96. Wrap remaining pins in (R) yarn. Row 83: Wrap (W) on pins 15, 17, 19-22, 26-29, 31, 33, 43, 45, 48-52, 55, 57, 60-64, 67, 69, 79, 81, 83-86, 90-93, 95, and 97. Wrap remaining pins in (R) yarn. Row 84: Wrap (W) on pins 14, 16, 19-23, 25-29, 32, 34, 44, 47-51, 54, 56, 58, 61-65, 68, 78, 80, 83-87, 89-93, 96 and 98. Wrap remaining pins in (R) yarn. Row 85: Wrap (W) on pins 13,15, 17, 20-23, 25-28, 31, 33, 35, 43, 46-50, 55, 59, 62-66, 69, 77, 79, 81, 84-87, 89-92, 95, 97, and 99. Wrap remaining pins in (R) yarn. Row 86: Wrap (W) on pins 21-23, 25-27, 45-49, 52, 55, 57, 60, 63-67, 85-87, and 89-91. Wrap remaining pins in (R) yarn. Row 87: Wrap (W) on pins 12-16, 19, 22, 23, 25, 26, 29, 32-36, 44-48, 51, 54, 55, 57, 58, 61, 64-68, 76-80, 83, 86, 87, 89, 90, 93, and 96-100. Wrap remaining pins in (R) yarn. Row 88: Wrap (W) on pins 13-17, 20, 23, 25, 28, 31-35, 53-55, 57-59, 77-81, 84, 87, 89, 92, 95-99. Wrap remaining pins in (R) yarn. Row 89: Wrap (W) on pins 11, 14-18, 21, 27, 30-34, 37, 45, 47, 49, 52-55, 57-60, 63, 65, 67, 75, 78-82, 85, 91, 94-98, and 101. Wrap remaining pins in (R) yarn. Row 90: Wrap (W) on pins 12, 15-19, 22, 24, 26, 29-33, 36, 46, 48, 51-55, 57-61, 64, 66, 76, 79-83, 86, 88, 90, 93-97, and 100. Wrap remaining pins in (R) yarn. Row 91: Wrap (W) on pins 11, 13, 16-20, 23, 25, 28-32, 35, 37, 47, 49, 51-54, 58-61, 63, 65, 75, 77, 80-84, 87, 89, 92-96, 99, and 101. Wrap remaining pins in (R) yarn. Row 92: Wrap (W) on pins 12, 14, 22, 24, 26, 34, 36, 48, 51-53, 56, 59-61, 64, 76, 78, 86, 88, 90 98, and 100. Wrap remaining pins in (R) yarn. Row 93: Wrap (W) on pins 11, 13, 16-20, 23, 25, 28-32, 49, 51, 52, 55, 57, 60, 61, 63, 75, 77, 80-84, 87, 89, 92-96, 99, and 101. Wrap remaining pins in (R) yarn. Row 94: Wrap (W) on pins 12, 15-19, 22, 24, 26, 29-33, 36, 51, 54, 56, 68, 61, 76, 79-83, 86, 88, 90, 93-97, and 100. Wrap remaining pins in (R) yarn. Row 95: Wrap (W) on pins 11, 14-18, 21, 27, 30-34, 37, 53, 55, 57, 59, 75, 78-82, 85, 91, 94-98, and 101. Wrap remaining pins in (R) yarn. Row 96: Wrap (W) on pins 13-17, 20, 23, 25, 28, 31-35, 56, 77-81, 84, 87, 89, 92, and 95-99. Wrap remaining pins in (R) yarn. Row 97: Wrap (W) on pins 12-16, 19, 22, 23, 25, 26, 29, 32-36, 48, 56, 64, 76-80, 83, 86, 87, 89, 90, 93, 96-100. Wrap remaining pins in (R) yarn. Row 98: Wrap (W) on pins 21-23, 25-27, 49, 56, 63, 85-87, and 89-91. Wrap remaining pins in (R) yarn. Row 99: Wrap (W) on pins 13,15, 17, 20-23, 25-28, 31, 33, 35, 50, 55, 57, 62, 77, 79, 81, 84-87, 89-92, 95, 97, and 99. Wrap remaining pins in (R) yarn. Row 100: Wrap (W) on pins 14, 16, 19-23, 25-29, 32, 34, 51-54, 56, 58-61, 78, 80, 83-87, 89-93, 96 and 98. Wrap remaining pins in (R) yarn. Row 101: Wrap (W) on pins 15, 17, 19-22, 26-29, 31, 33, 50, 55, 57, 62, 79, 81, 83-86, 90-93, 95, and 97. Wrap remaining pins in (R) yarn. Row 102: Wrap (W) on pins 16, 19-21, 24, 27-29, 32, 49, 54, 56, 58, 63, 80, 83-85, 88, 91-93, and 96. Wrap remaining pins in (R) yarn. Row 103: Wrap (W) on pins 17, 19, 20, 23, 25, 28, 29, 31, 49, 53, 56, 59, 63, 81, 83, 84, 87, 89, 92, 93, and 95. Wrap remaining pins in (R) yarn. Row 104: Wrap (W) on pins 9, 19, 22, 24, 26, 29, 39, 41, 50-52, 56, 60-62, 71, 73, 83, 86, 88, 90 93, and 103. Wrap remaining pins in (R) yarn. Row 105: Wrap (W) on pins 21,23, 25, 27, 56, 85, 87, 89 and 91. Wrap remaining pins in (R) yarn. Row 106: Wrap (W) on pins 9, 24, 39, 41, 56, 71, 73, 88, and 103. Wrap remaining pins in (R) yarn. Row 107: Wrap (W) on pins 16, 24, 32, 56, 80, 88, and 96. Wrap remaining pins in (R) yarn. Row 108: Wrap (W) on pins 9, 17, 24, 31, 39, 41, 56, 71, 73, 81, 88, 95, and 103. Wrap remaining pins in (R) yarn. Row 109: Wrap (W) on pins 18, 23, 25, 30, 56, 82, 87, 89 and 94. Wrap remaining pins in (R) yarn. Row 110: Wrap (W) on pins 9, 19-22, 24, 26-29, 39, 41, 56, 71, 73, 83-86, 88, 90-93, and 103. Wrap remaining pins in (R) yarn. Row 111: Wrap (W) on pins 12, 18, 23, 25, 30, 36, 44, 56, 68, 76, 82, 87, 89, 94, and 100. Wrap remaining pins in (R) yarn. Row 112: Wrap (W) on pins 9, 12, 17, 22, 24, 26, 31, 36, 39, 41, 44, 56, 68, 71, 73, 76, 81, 86, 88, 90, 95 100, and 103. Wrap remaining pins in (R) yarn. Row 113: Wrap (W) on pins 12, 17, 21, 24, 27, 31, 36, 44, 56, 68, 76, 81, 85, 88, 91, 95, 100. Wrap remaining pins in (R) yarn. Row 114: Wrap (W) on pins 5, 9, 15, 18-20, 24, 28-30, 33, 39, 41, 48, 52, 56, 60, 64, 71, 73, 79, 82-84, 88, 92-94, 97, 103, and 107. Wrap remaining pins in (R) yarn. Row 115: Wrap (W) on pins 12, 24, 36, 44, 56, 68, 76, 88, and 100. Wrap remaining pins in (R) yarn. Row 116: Wrap (W) on pins 5, 9, 15, 24, 33, 39, 41, 48, 52, 56, 60, 64, 71, 73, 79, 88, 97, 103, and 107. Wrap remaining pins in (R) yarn. Row 117: Wrap (W) on rows 3 to 109. Wrap basic weave on pegs 1 and 2, and then loosely to 110 and 111 with (R) yarn. Row 118: Wrap (W) on pin 3, then even-numbered pins from 4-108, and 109. Wrap remaining pins in (R) yarn. Row 119: Repeat row 117. Tie off and cut (W) yarn. 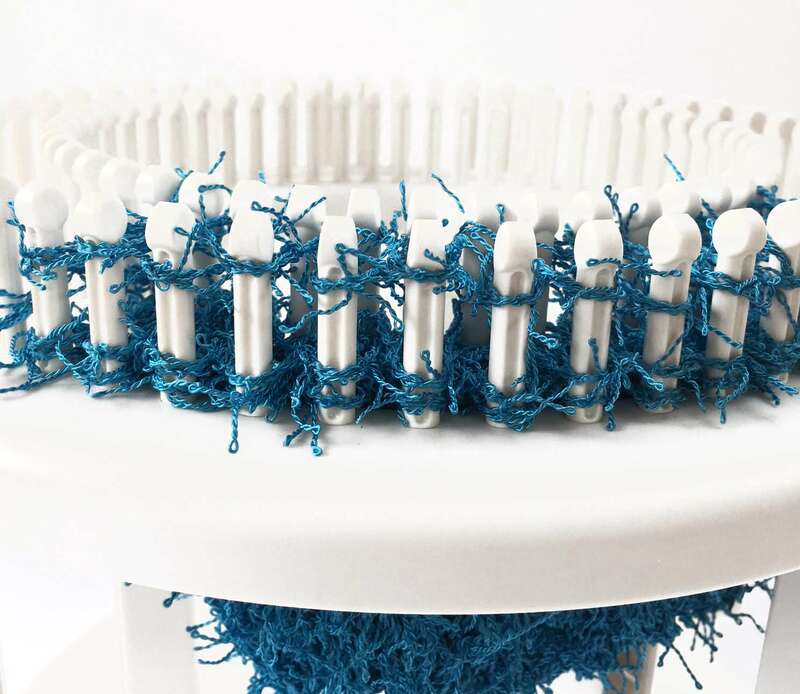 Rows 120 – 126: Work in (R) yarn. Row 127: Repeat row 19. Row 128: Repeat row 18. Row 129: Repeat row 17. Row 130: Work row in (R) yarn. Rows 131-135: Repeat Row 15, 14, 13, 12,11. Row 136: Work row in (R) yarn. Row 137: Repeat Row 9. Tie off and cut (W) yarn. Row 138: Work row in (R) yarn. Rows 139 – 144: Work in Rib stitch. Row 145: Work in (R) yarn in stockinette. Bind off 2 over 2 with crochet hook. Bind off at anchor yarn in 2 over 2 and remove anchor yarn. Weave in yarn tails. Jean, you can copy it to your desktop and save it to your computer. 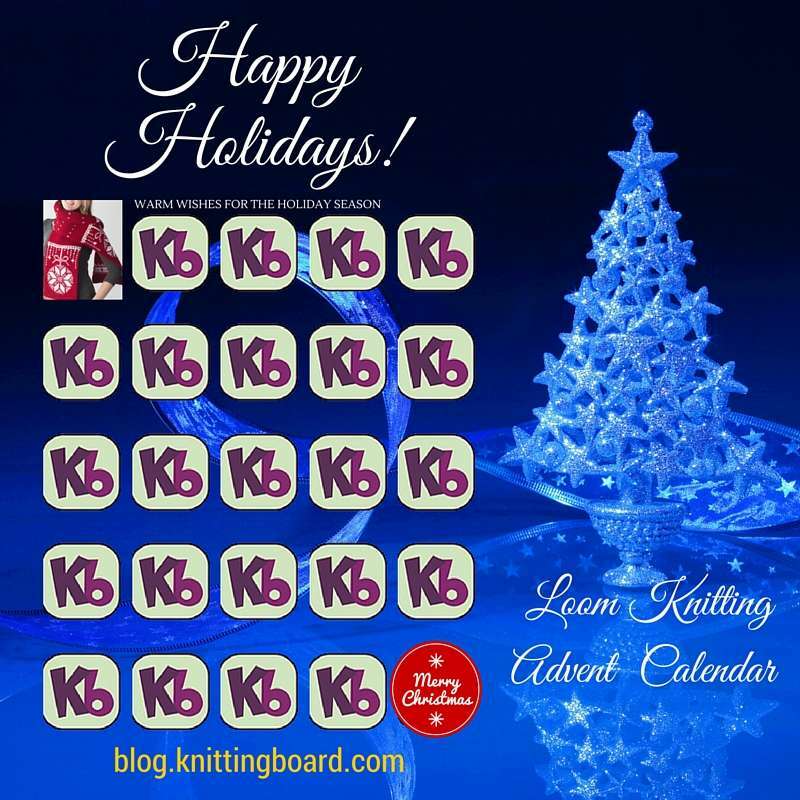 Loom Knitting Advent, Day 10, brings you another lovely double knit square! Frosty the snowman! 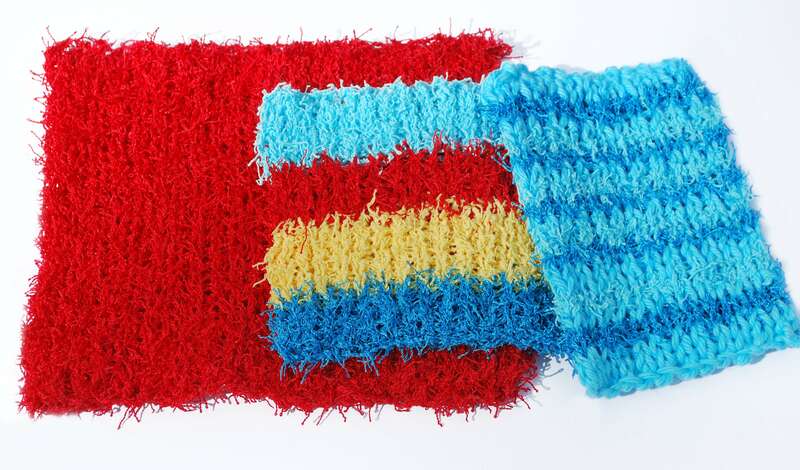 Add this beautiful intarsia design to any of your double knits! Yarn: Paton’s Classic Wool Roving, 100% wool #5, 120 yds per skein. Hand wash and dry flat. Colors Grey/blue (G), White (W), Cranberry (C), Black (B), Cherry Red (R), Orange (O). 1 skein of G and W yarn and 1 skein B, and ½ skein of C, R, and small amount of O yarn for nose. Black yarn will need to be of another yarn company. 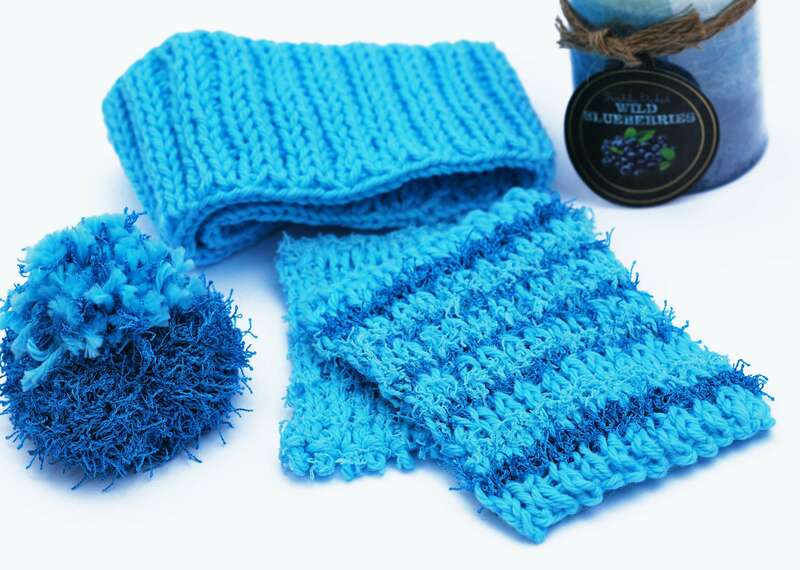 Any wool or blend #5 yarn can be used. 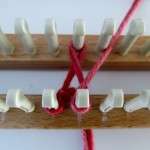 Abbreviations: R=right, L=left, Back to back weave=b/b, This is a single pass to cover both pegs of one stitch by wrapping top peg, straight down to bottom peg. See photo at end of instructions. 1-Always start the square at the bottom of the graph, working from L to R. Focus only on that row, until completed. 2-Be sure to start each row with the loom facing you. The cast on yarn tail will be on the left side. Check this before starting a new row, so the design will be correctly applied. 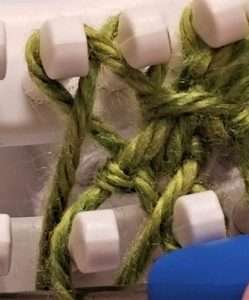 3-If you have a stitch that you want to stand out, such as a snowflake, or the snowman’s eye, you can wrap the pegs with a double wrap. 4-When following the graph on paper, be sure to line-out each row once it is complete. You may also want to fold the printed graph over after each row, so that you are always looking at the current row. Also, best to number the stitches 1-30 across the bottom. 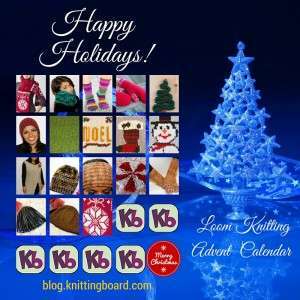 5-Try to use one continuous stockinette stitch on any color that has several rows, or more than just a few stitches. 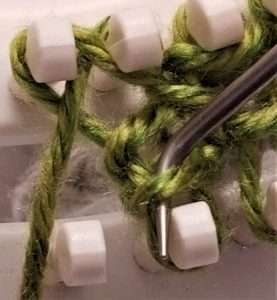 Then use the b/b wrap on pegs of just a single, or a few stitches. 6-If you carry the main background color throughout the square, it will connect the colors next to it. 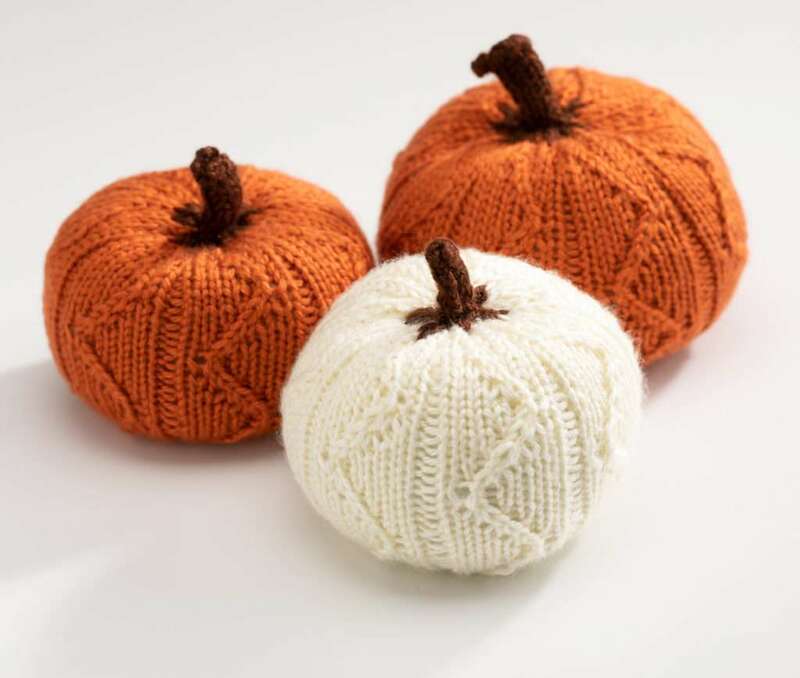 If you choose to cut separate yarns for each color used, you will need to twist the 2 yarns together at each joint, or cut and tie the colors together. 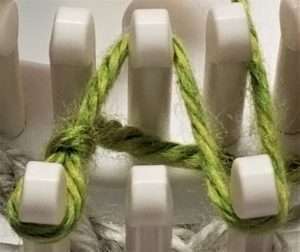 7-If you have just a few stitches of a color, it is best to cut a piece of the yarn, tie it into the row when needed. 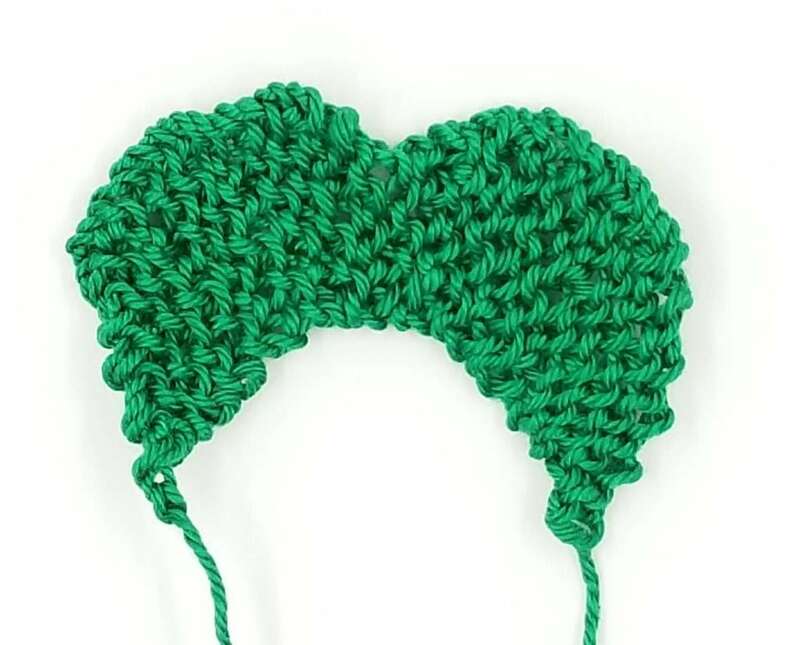 Leave it attached until all the stitches are complete for that color, even when it consists of several rows, then you can tie it to adjoining yarn and knot. Example of this would be orange nose of snowman. 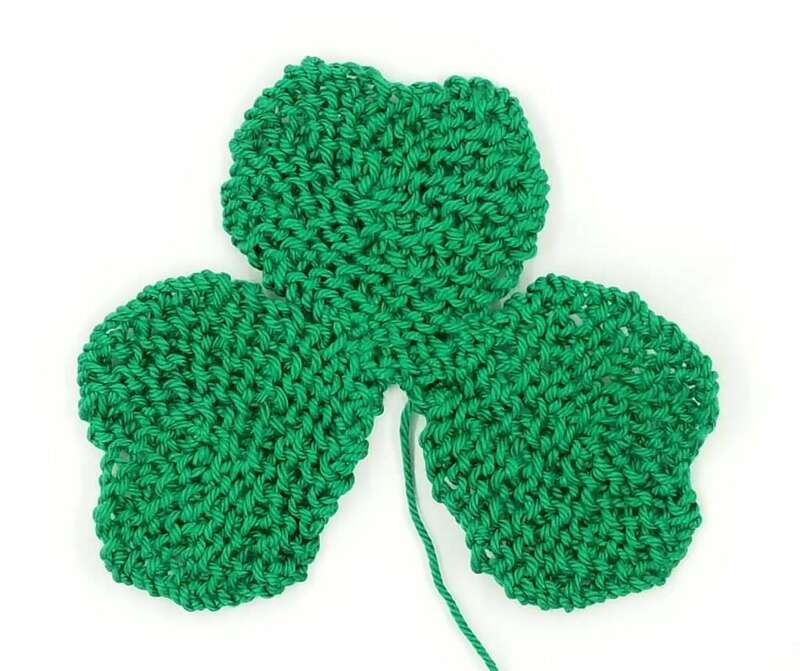 8-You can add some accents to the square after it’s complete with some extra stitches, using yarn and tapestry needle, if desired. Example of this would be some falling snow around the snowman. The (W), and (G), and (C) yarns will be done in stockinette weave, unless otherwise noted. Follow instructions for accent colors of (B), (O), and (R). Row 1: Cut 2 pieces of (B) yarn, 4’ long, and 2’ long. Tie on the skein at stitch #5, and 4’ one at stitch #27. Set aside the 2′ piece until next row. Weave each of these stitches with (B) in b/b weave. Tie on (W) yarn at stitch #6. Work stitches 6-26 in stockinette. Complete row in stockinette with (G) yarn on all pegs not covered with accenting yarns by dragging from L side across to peg #28-30. Hook over all. Row 2: Tie on the 2’ piece of (B) yarn to peg #16 and wrap in b/b. Wrap peg #5 and #27 with (B) yarns attached. Work pegs #6-26 in (W) and complete with (G) on all other pegs in stockinette. Hook over. Row 3: Tie on (C) yarn at peg #23 and work pegs 23 and 24 in stockinette. Work pegs 5 and 27 with respective black yarns in b/b. Complete row with (W) and (G) yarns, in stockinette, and hook over all. Row 4: Work pegs 22 and 23 in (C) yarn in stockinette. Work (B) yarns on peg 6, and 26, b/b. Work the center pegs with (W) yarn on pegs 7-25 skipping the pegs wrapped with (C) yarn. Complete row with (G) yarn skipping all pegs already wrapped and hook over all. Row 5: Work pegs 6, 16, and 26 in respective (B) yarns in b/b each. Work pegs 21-24 in (C) yarn in stockinette. Work (W) pegs in center skipping pegs wrapped in other yarns. Complete with the (G) stitches on pegs 1-5, dragging over to wrap pegs 27-30 in stockinette. Hook over all. Cut and weave in the (B) yarn, center, at buttons. Row 6: Work pegs 6 and 26 with respective (B) yarn. Wrap pegs 19-24 with (C) yarn. Complete row, working yarns (W) and (G) in stockinette. Hook over. Row 7: Work pegs 7 and 25 in (B) yarns, b/b. Work pegs 16-23 in (C) yarn, stockinette. Work (W) yarn on center stitches 8-24 skipping the (C) stitches. Complete row in stockinette with (G) yarn. Hook over. Row 8: Work pegs 8 and 24 in (B) yarn, b/b weave. Work pegs 15-20 with (C) yarn. Work pegs 9-23 in stockinette with (W) yarn skipping the pegs with (C) yarn. Work pegs remaining in stockinette with(G) yarn to complete row. Tie and knot (W) yarn. 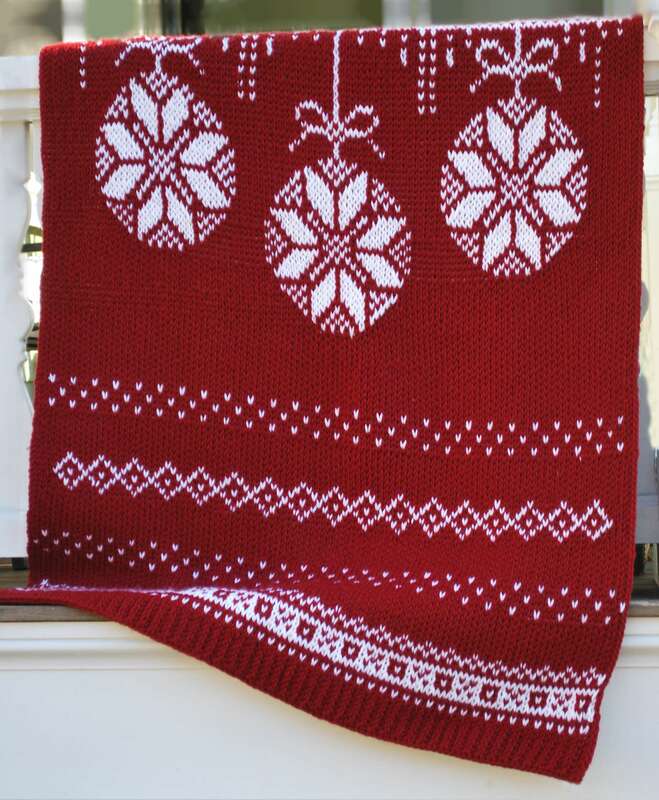 The white snow flakes can be added with (W) yarn when the knitting is complete. Hook over all. Row 9: Work pegs 9 and 23 with (B) in b/b weave. Work pegs 10-22 in (C) yarn in stockinette. Work pegs remaining with (G) yarn in stockinette. Tie and knot both (B) pieces of yarn and trim tails. Hook over. Row 10: Work the (C) stitches on pegs 8-24 in stockinette. 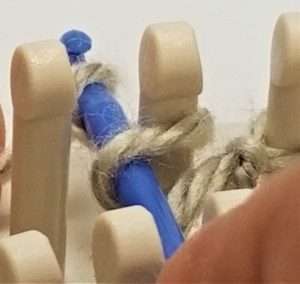 Work pegs 1-6 and drag to work pegs 25-30 with (G) yarn. Hook over. Row 11: Work pegs 9-23 in (C) yarn in stockinette. Cut and tie off. Complete row with (G) yarn and hook over. Row 12: Tie on (B) (partial skein) yarn at peg #12. Work pegs 13-19 with (B) yarn, b/b weave leaving the yarn at peg 19 to work all R side stitches. Work pegs 1-12 with (G) and drag to pegs 20-30 in stockinette. Hook over all. Row 13: Tie on remaining skein of (B) yarn to peg #12. This will be used for all L side stitches. 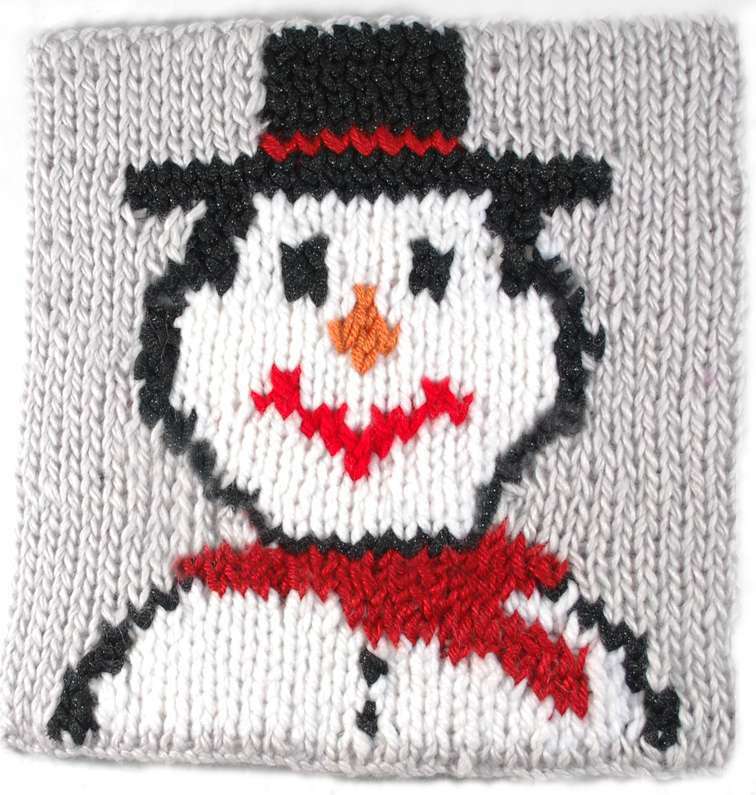 Tie on (W) yarn at peg 13 to start the snowman’s face. Work pegs 12 and 20 with the (B) yarns in b/b. Work pegs 13-19 with (W) in stockinette. Work pegs 1-11 and drag to pegs 21-30 with (G) yarn in stockinette. Hook over. Row 14: Work pegs 11 and 21 with (B) yarns, b/b. Work pegs 12-20 with (W) yarn in stockinette. Complete row, with (G) yarn in stockinette on all remaining pegs. Hook over. Row 15: Work pegs 10 and 22 in (B) yarns, b/b. Work pegs 11-21 in (W) in stockinette. Complete row with (G) yarn in stockinette on all remaining pegs. Hook over. Row 16: Tie on bright red (R) yarn at peg #16 and weave stitch , b/b. Work pegs 9 and 23 with (B) yarns, b/b. Work pegs 10-22 in (W) skipping the (R) stitch. Complete row with (G) yarn on pegs 1-8 and drag to pegs 24-30. Hook over. 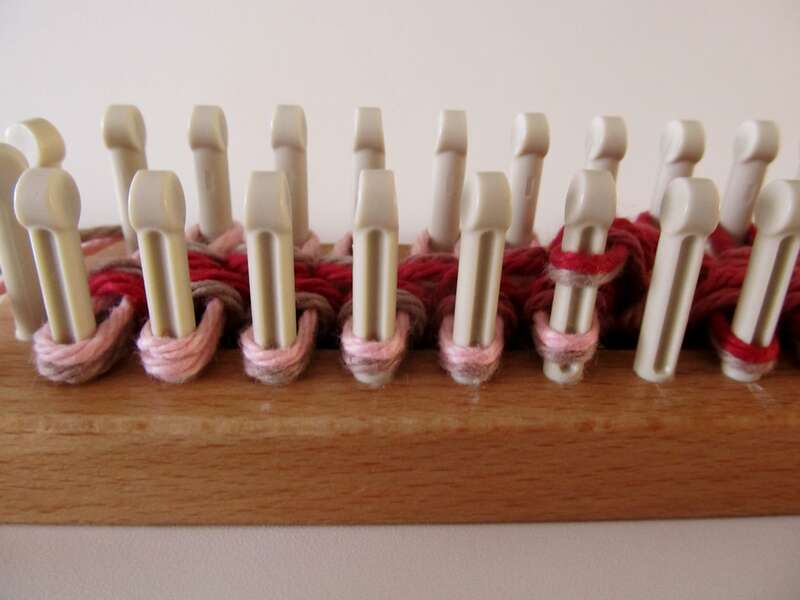 Row 17: Work (R) on pegs 15-17 in b/b weave. Work pegs 9 and 23 in (B) yarns. Work pegs 10-23 with (W) skipping the (R) pegs. Complete row with (G) yarn on all remaining pegs and hook over. Row 18: Work pegs 14-15 and skip over to pegs 17-18 in (R) yarn in b/b. Work pegs 8 and 24 in (B) yarns, b/b. Work pegs 9-23 with (W) skipping the pegs with (R). Complete row with (G) yarn skipping all the pegs with other colors. Hook over all. Row 19: Work pegs 12-13 and 19-20 with (R) yarn, b/b. Work pegs 8 and 24 with (B) yarns, b/b. Work pegs 9-11 and 14-18, and 21-23 with (W) yarn in stockinette. Complete row on remaining pegs with (G) yarn in stockinette. Hook over. Row 20: Work pegs 13 and 19 in (R) yarn, b/b. Work pegs 8 and 24 in (B) yarns, b/b. Work pegs 9-23 with (W) yarn skipping the (R) pegs. Cut and knot (R) yarn. Compete the row with (G) yarn in stockinette. Hook over. Row 21: Work pegs 8 and 24 with (B) yarns, b/b. Work pegs 9-23 with (W) yarn in stockinette. Complete row with (G) yarn in stockinette. Row 22: With a piece of (O) Orange yarn aprox 2’ long, tie on at peg #16. Weave stitch with b/b weave. This is the start of Frosty’s nose. Work pegs 7-8 and 24-25 with (B) yarn, b/b. In stockinette work pegs 9-23 with (W) yarn skipping the (O) stitch. Complete the row with (G) yarn in stockinette and hook over. Row 23: Work pegs 15-17 with (O) yarn, b/b. Work pegs 8 and 24 in respective (B) yarns, b/b. Work in stockinette on pegs 9-23 with (W) yarn skipping the pegs of the nose. Complete the row with (G) yarn in stockinette. Hook over. Row 24: Work peg #16 with (O) yarn, b/b. Work stitches with (B) yarn on pegs 8 and 24. Complete the row working the (W) and (G) yarns. Hook over. Row 25: Work peg #16 with (O) yarn, b/b. Work pegs 8 and 24 with (B) yarns, b/b. Work center of Frosty with (W) yarn on pegs 9-23 skipping the orange stitch. Cut and knot the (O) yarn. Complete row with (G) yarn in stockinette. Hook over. Row 26: Work pegs 9-10, and 13-14 in 1st (B) yarn on L side. Work pegs 18-19 and 22-23 in (B) yarn from R side, all in b/b weave. Work pegs 11-12, and 15-17, and 20-21 with (W) yarn In stockinette. Complete row with (G) yarn in stockinette. Hook over. Row 27: Repeat row 26. Row 28: Work pegs 10 and 14 with (B) yarn from L side. Work pegs 18 and 22 with (B) yarn from R side, b/b. Work (W) yarn on pegs 11-13 and 15-17, and 19-21 in stockinette. Complete row with (G) yarn. Hook over. Row 29: Work pegs 10-11 with (B) yarn from L side. Work pegs 21-22 with (B) yarn from R side, b/b. Work pegs 12-20 with (W) yarn in stockinette. Complete row with (G) yarn, in stockinette. Hook over. Row 30: Repeat row 29. Tie off R side (B) yarn. Cut with 2” tail. Row 31: Drag (B) yarn to peg 7, and work in stockinette from peg 7-25. Complete row with (G) yarn, in stockinette. Hook over. Row 32: Repeat row 31. Row 33: Tie on (R) yarn at peg 13. Weave in stockinette on pegs 13-19. Tie, and knot. Work all other pegs with (G) yarn in stockinette skipping the (R) pegs of the hat. Hook over. Rows 34-39: Work on pegs 13-19 with (B) yarn in stockinette. Complete each row with (G) yarn in stockinette skipping the (B) yarn. After completing row 39, tie and knot the (B) yarn. Row 40: Work in stockinette with (G) yarn. Cut yarn with 3” yarn tail. Bind off with crochet hook, starting at end opposite the yarn tail, and work with 2-loop method. Bind off at anchor yarn, starting at end opposite the yarn tail. Remove the anchor yarn. Weave in all yarn tails. Snowflakes: Using the tapestry needle and (W) yarn, weave to cover each stitch where a snowflake is desired. Carry the yarn between the layers of knit to next location, and weave next snowflake. 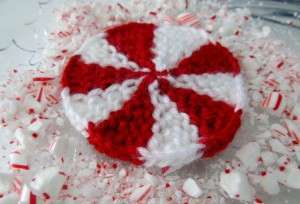 Only one stitch is needed for each snowflake. Once complete, just trim yarn tail and weave into the knitting. 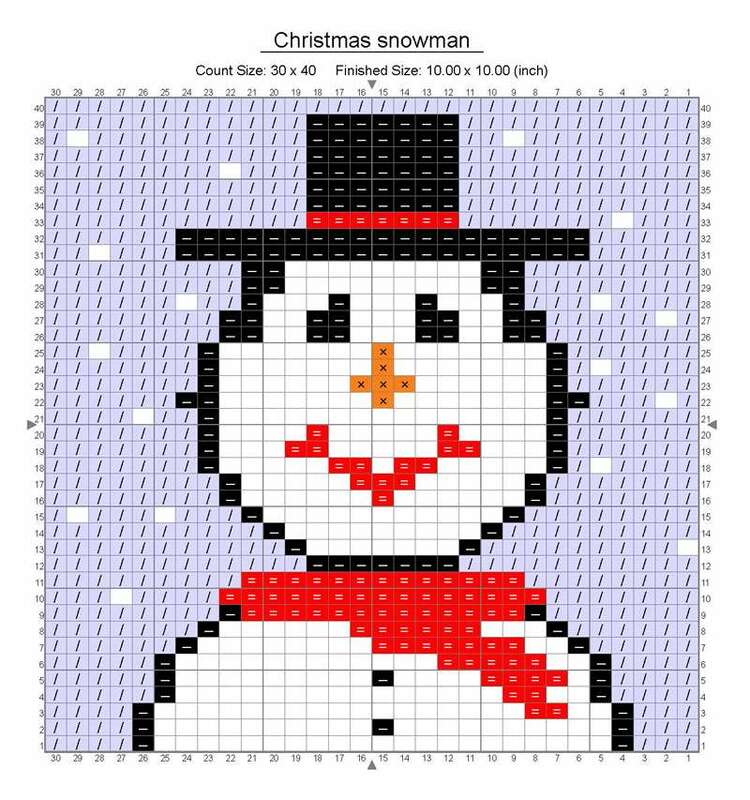 Mist and lightly block the snowman square for a nice even look. Back to back weave: White yarn is wrapped from top peg to lower peg in b/b. The red yarn continues in stockinette stitch. Loom Knitting Advent, Day 9, brings you another lovely double knit square! 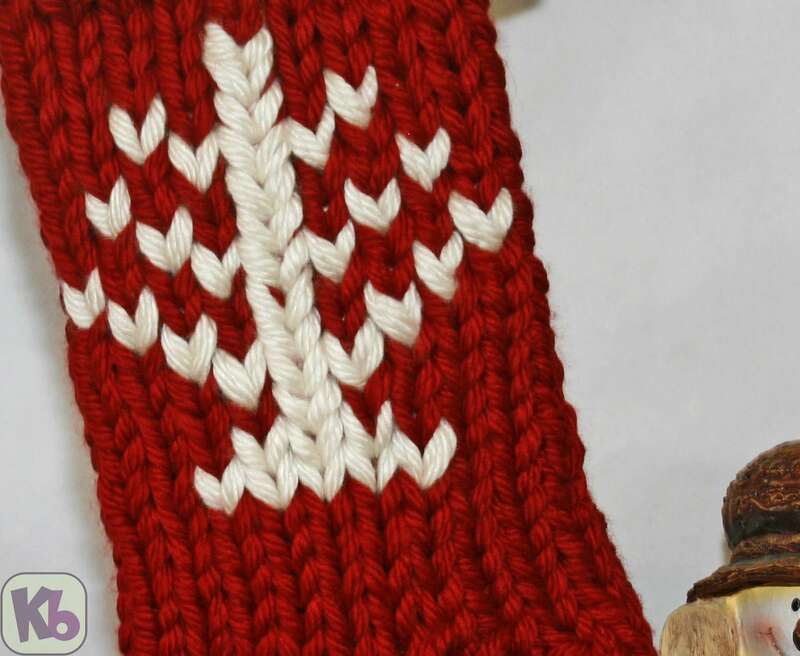 Add this beautiful intarsia design to any of your double knits! Yarn: Patons Classic Wool Roving #5, 100% wool, hand wash and dry flat. Natural background 1 skein, Dark Green ½ skein, Cherry red ½ skein, Aran white ½ skein, Lion Brand Homespun Holiday Green 5 yds for stripes. N=natural, S=Spruce green, R=Red, G=green holiday, W=white. Stitches: Stockinette and back- to- back wrap (similar to Figure 8, but not twisted), covering both front and back pegs of one stitch, working straight across from top peg to lower. Used when a design is only a single stitch or a few stitches. See photo at end of pattern. 1.Always start the square at the bottom of the graph, working from L to R. Focus only on that row, until completed. Be sure to work the graph from Left to Right. 2.Be sure to start each row with the loom facing you. The cast on yarn tail will be on the left side. Check this before starting a new row, so the design will be correctly applied. 3.When following the graph on paper, be sure to line-out each row once it is complete as you work up the graph. You may also want to fold the printed graph over after each row, so that you are always looking at the current row. Re mark the peg numbers. 4.Try to use one continuous stockinette weave on any color that has several rows, or more than just a few stitches. 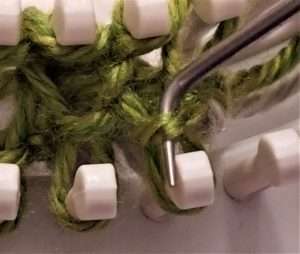 Then use the b/b wrap on pegs of just a few stitches. 5.If you carry the main background color throughout the square, it will connect the colors next to it. If you choose to cut separate yarns for each color used, you will need to twist the 2 yarns together at each joint, or cut and tie the colors together. 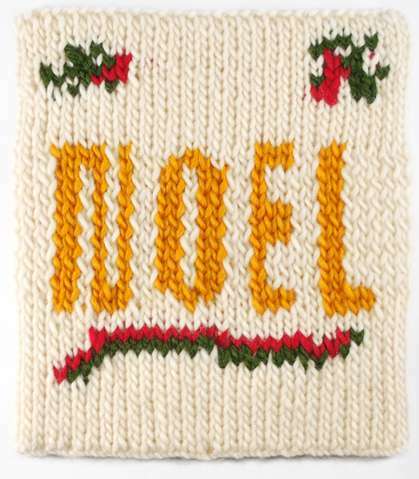 Example of this is the holly berries on cuff of stocking. 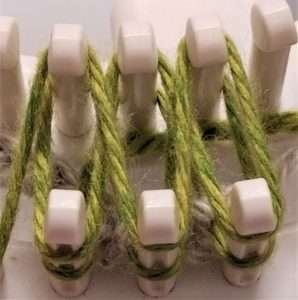 6.If you have just a few stitches of a color, best to cut a piece of the yarn, tie it into the row when needed. 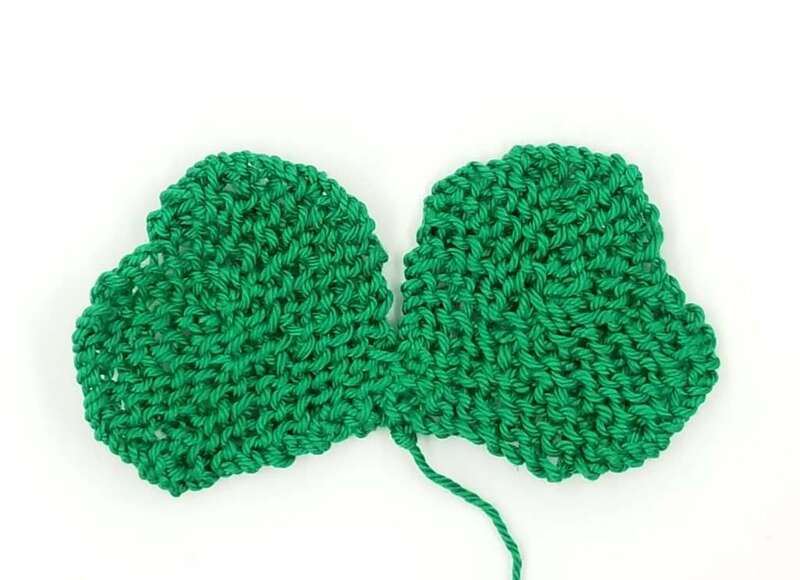 Leave it attached until all the stitches are complete for that color, even when it consists of several rows, then you can tie it to adjoining yarn and knot. Once the square is complete, it is recommended to mist with warm water and block. Allow wool to dry completely before using it in your project. Cast on 30 stitches in natural color (N) in Stockinette stitch. Rows 1-5: Work in stockinette. Row 6: For toe and heel areas, cut 2 strands, each 3’ long in (S) color. Tie on one yarn at peg 9, and one at peg 20, between the boards. Tie on the (R) yarn at peg 12. Work the (S) and (R) stitches in stockinette, twisting them together at the joints. Lay these yarns down. Work the (N) yarn across the stitches in stockinette stitch, starting at peg 1, skip over the (R) and (S) and continue to end of row. Hook bottom loop over on all pegs. Row 7: Looking at the graph, you see that the (S) sts start 2 pegs before the ones on row 6. Take the (S) and wrap pegs 7, 8, 9 and 10, twist with (R), wrap next 9 pegs with (R), twist, wrap next 4 pegs with the 2nd (S) yarn. Work in stockinette with (N) yarn starting at peg 1 and work over the (S) and (R) yarns to complete the row. Hook over all stitches. Rows 8-11: Follow the graph working with the (N), (S), and (R) yarns. Row 12: Cut the 2 (S) yarns leaving about 3” tails. This row is just (N) and (R) yarns. 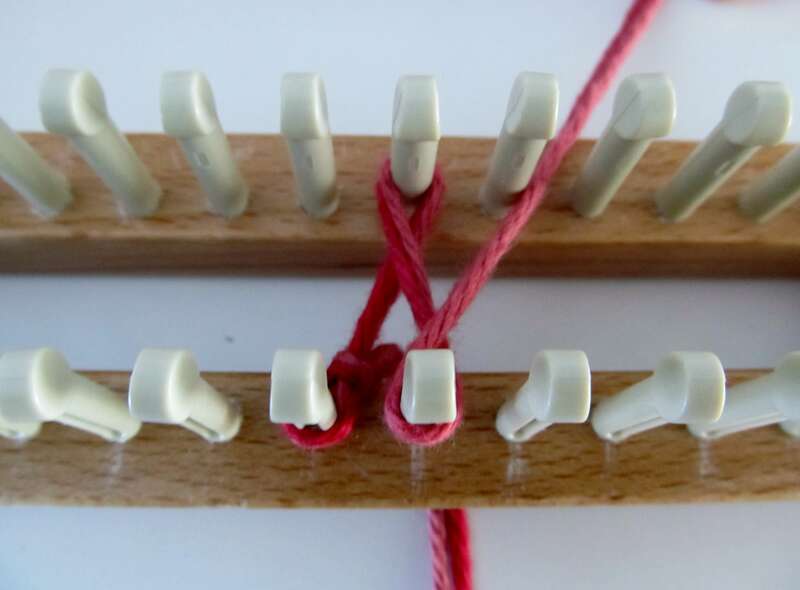 Work the pegs with the (R), and when you get to the (S) yarn tails, tie them on to the (R) to secure. Lay the tails on the knitting with 1” tails. Work the (N) yarn over the entire row in stockinette stitch. Hook over all stitches. Rows 13-14: Follow graph with (N) and (R) yarns. Do not cut the (R) yarn. Row 15: On peg 15, tie on the (G) holiday yarn. Work 8 stitches in (G) with b/b knit. Cut and knot. Work the (N) yarn over entire row in stockinette. Hook over. Rows 16-17: Work the graph with (R) and (N) yarn. Row 18: On peg 13, tie on (G) yarn and work for 9 sts in b/b knit. Finish the row with (N) yarn in stockinette. 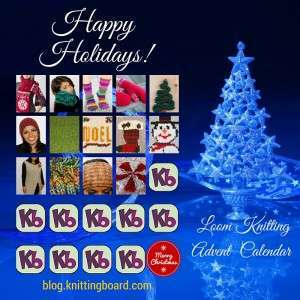 Rows 19-21: Work with (R) and (N) yarn in stockinette. Row 22: With (G) yarn, work in b/b knit for 11 stitches. Cut and knot. Complete the row with (N) yarn in Stockinette. Rows 23-24: Work the graph with (R) and (N) yarns. Row 25: Tie on (S) yarn and work in stockinette for 11 stitches. Complete row with (N) yarn in stockinette. Row 26: Work with (R) and (N) yarns. 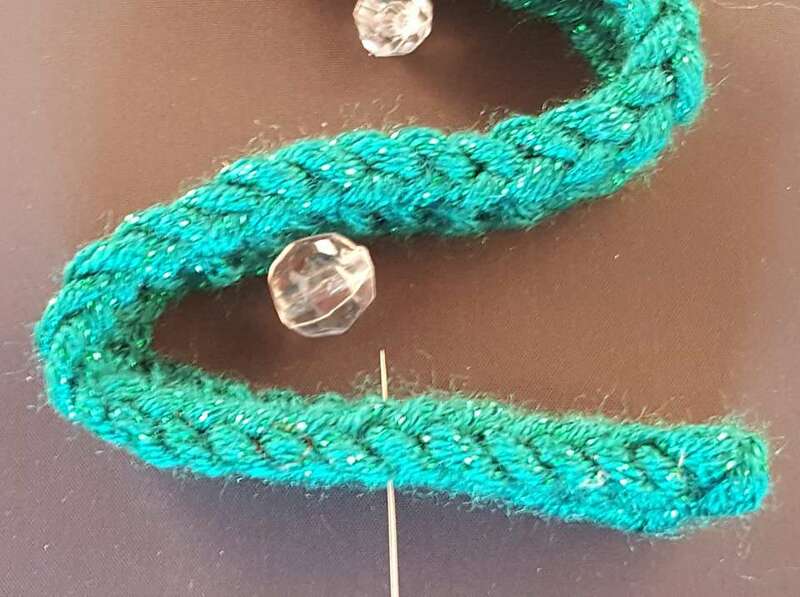 Cut and knot the (R) yarn with 1” tail. Row 27: Work the graph with (S) and (N) yarns. Cut and knot the (S) yarn. Row 28: Tie on the (W) yarn at 11th peg for the top of stocking. Work in stockinette for 15 stitches. Complete the row with (N) yarn in stockinette. Cut 2 pieces of (S) yarn about 3’ long. Cut 2 pieces of (R) yarn about 2’ long. Row 29: Tie on one (S) yarn at peg 23. 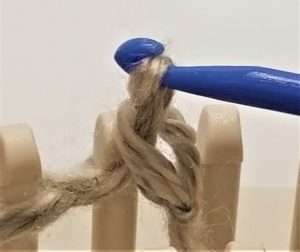 Double wrap this peg with (S) in b/b weave. Start the (W) yarn at peg 9 and work in stockinette for 17 stitches, skipping peg 23 where you have placed the (S) yarn. Complete the row with (N) yarn in stockinette. Row 30: Tie in the (S) (2nd piece) on peg 13 and double wrap this peg in b/b weave. Tie on one piece of (R) yarn on peg 23 and double wrap. Double wrap peg 22 and 24 with the (S) yarn in b/b weave. Pick up the (W) yarn and work the pegs skipping over the (R) and (S) stitches in stockinette. Complete the row with (N) yarn in stockinette. Row 31: Tie on the 2nd (R) yarn at peg 13 and double wrap. Wrap all pegs with the (R) and (S) yarn per the graph. Complete the row with (W) yarn and then (N) yarn in stockinette. Row 32: Work the (R) and (S) yarn on pegs for this row. After last (R) stitch, cut and tie the (R) yarn as it is done. Complete row. Rows 33-36: Follow the graph to complete the (R) and (S) designs. Cut and knot the yarns. Complete the rows with (W) yarn and (N) yarn in stockinette. Row 37-40: Work all 30 stitches in (N) yarn in stockinette stitch. Bind off with 2- loop method. Bind off at anchor yarn and gently remove the anchor yarn. Weave in any yarn tails. Lightly block the square and it’s ready to be a beautiful holiday accent, scarf, or afghan. You can mix it with other Holiday designs or with solid color ones. BACK TO BACK WEAVE: Demonstrated with the white yarn. 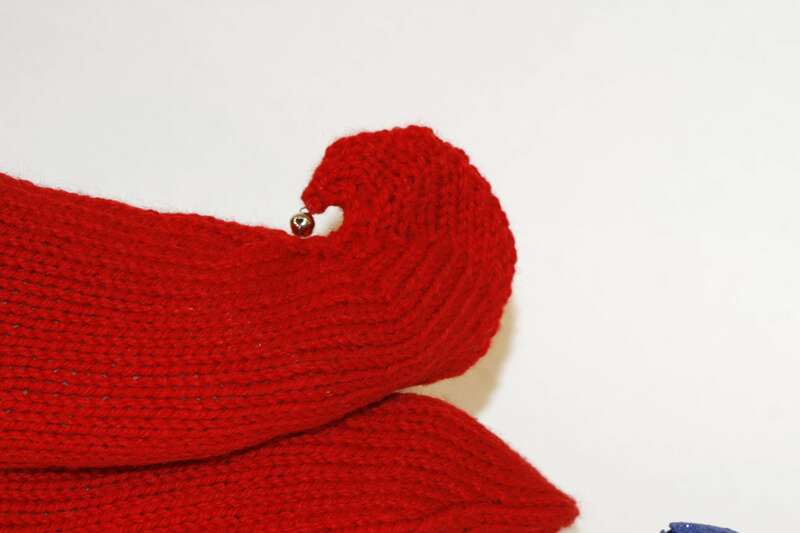 Red yarn is worked in stockinette. The pattern chart is not showing up at the end of the pattern. Thank you for letting us know. We have added the graph. 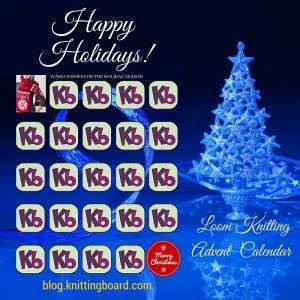 Loom Knitting Advent, Day 8, brings you a lovely double knit square that you can incorporate into any double knit item. Yarn: Patons Classic Wool Roving #5, 100% wool, hand wash and dry flat. Aran 77008, 1 skein, gold 77615, ½ skein, Cherry red and Spruce green, aprox 1/4 skein of each. Stitches: Stockinette and Figure8 (if desired) for center section, or b/b weave for some areas of color. Abbreviations: R=right, L=left, b/b weave=back to back wrap. 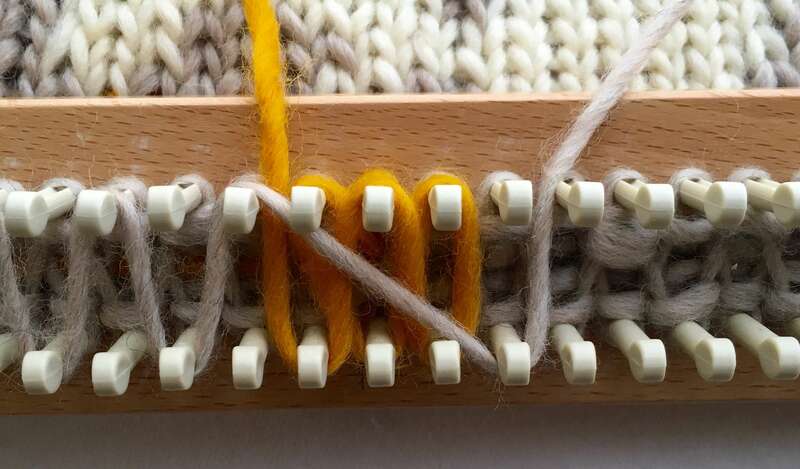 Wrap back and front peg of a stitch by going straight across the loom. Do not twist the yarn as in Figure8. See photo at bottom of pattern. 1. Always start the square at the bottom of the graph, working from L to R. Focus only on that row, until completed. Be sure to work from left side of graph to right side, and from bottom to top following rows. 2. Be sure to start each row with the loom facing you. The cast on yarn tail will be on the left side. Check this before starting a new row, so the design will be correctly applied. 3. When following the graph on paper, be sure to line-out each row once it is complete. You may also want to fold the printed graph over after each row, so that you are always looking at the current row. 4. 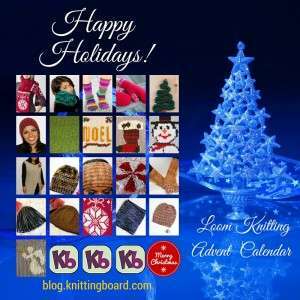 Try to use one continuous stockinette weave on any color that has several rows, or more than just a few stitches. The center of this square at the Noel rows can be done in Figure8. 5. If you carry the main background color throughout the square, it will connect the colors next to it. If you choose to cut separate yarns for each color used, you will need to twist the 2 yarns together at each joint, or cut and tie the colors together. 6. If you have just a few stitches of a color, it is best to cut a piece of the yarn, tie it into the row when needed. 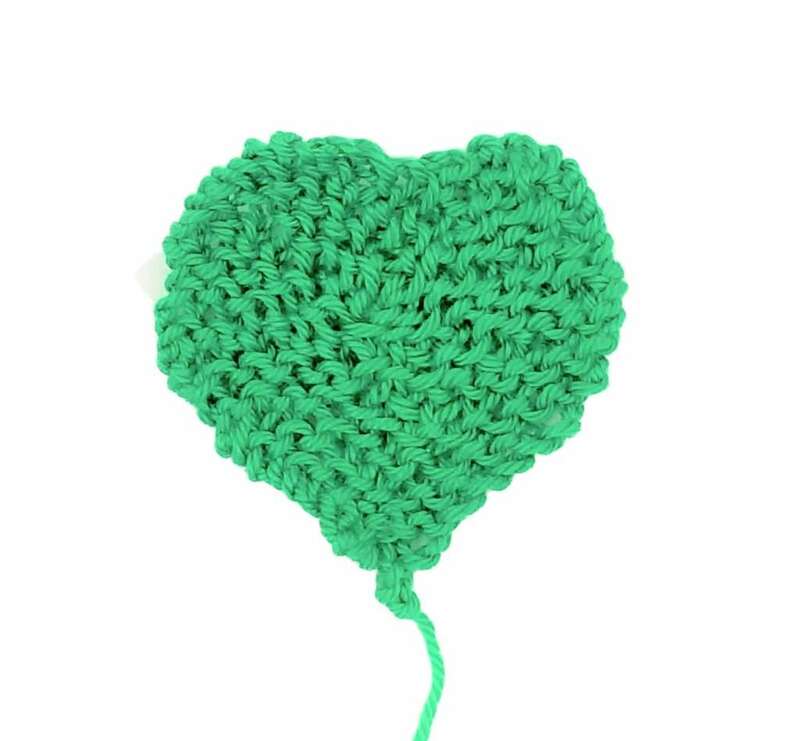 Leave it attached until all the stitches are complete for that color, even when it consists of several rows, then you can tie it to adjoining yarn and knot. 7. Once the square is complete, recommend to mist with warm water and block. 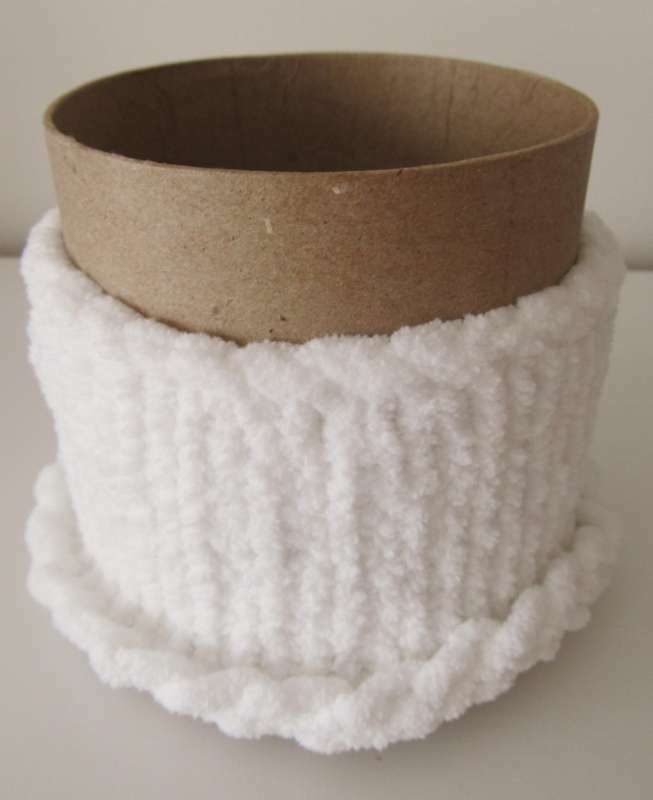 Allow wool to dry completely before using it in your project. Cast on 30 stitches in stockinette with (A) yarn. Rows 1-6: Work 6 rows in stockinette stitch. Row 7: Tie on (R) yarn on st 4 and wrap b/b weave on this stitch. Tie on (S) yarn on st 5 and wrap b/b on stitch 5. 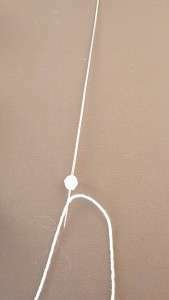 Drag (S) yarn to peg 21-22-23 and wrap b/b. Work in (A) yarn in stockinette across row skipping the stitches covered with (R) or (S) yarn. Hook over. Row 8: Follow graph. Wrap pegs 5, 21,22,23 with (R) yarn. Lay down yarn. Wrap peg 6, 15-20 and 24 with (S) yarn, in b/b wrap. Work in (A) yarn in stockinette across row skipping the stitches covered with color yarns. Hook over all. Row 9: Work pegs 7-14 and 25 in (R) yarn, b/b wrap. Wrap peg 26 with (S) yarn. Work in (A) yarn in stockinette across row skipping the stitches covered with color yarns. Hook over all. Rows 10-11: Work 2 rows in A) yarn in stockinette. 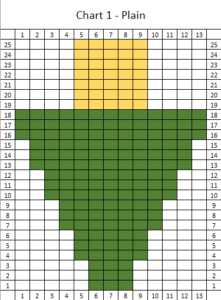 Rows 12-26: Work each row of Noel following the graph. 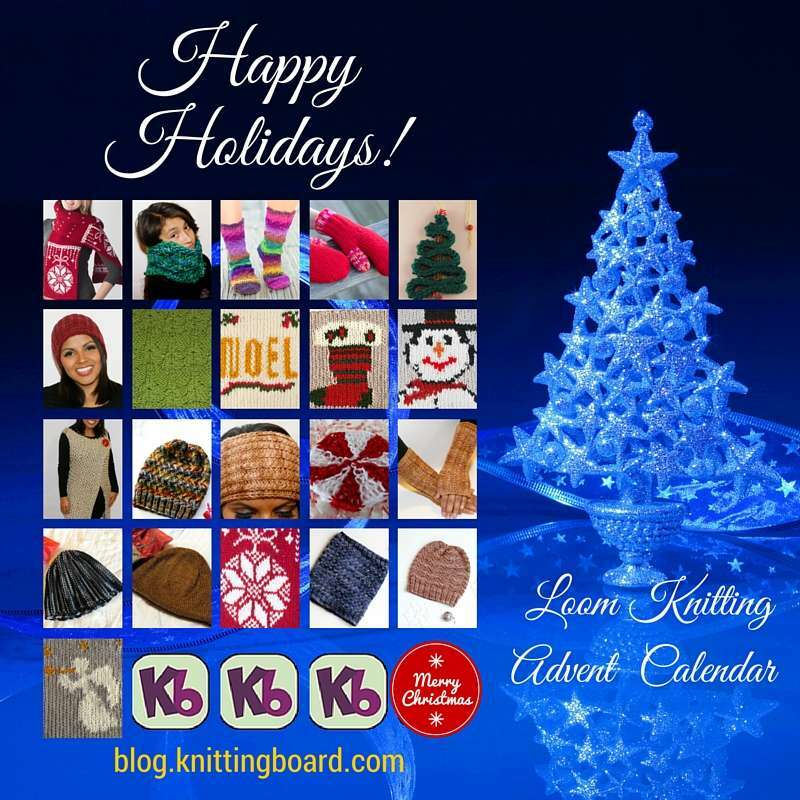 You can work all rows with Figure8 or work the (G) stitches with b/b and (A) stitches in stockinette. It is recommended that you continue with the color, now (G) in b/b and the (A) in stockinette as this will give a more uniform appearance. 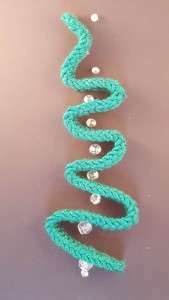 The sample was done with the Figure8 on all stitches. Rows 27-31: Work in stockinette with (A) yarn. Cut (2) pieces of (S) yarn aprox 3′ long and (2) pieces of (R) yarn aprox 2′ long. Row 32: Tie on one piece of (S) yarn at peg 4. Tie on one piece of (R) yarn at peg 7. 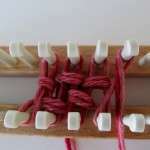 Work pegs 4-5 with (S) yarn, b/b weave. Work pegs 7-8 with (R) yarn. Leave the pieces attached. Work the row in stockinette with (A) yarn skipping the pegs wrapped with the color yarns. Hook over. Row 33: Tie on the 2nd (R) yarn onto peg 25 and weave that peg, b/b. Tie on the 2nd piece of (S) yarn at peg 27 and weave that peg, b/b. Lay yarns down. Work pegs 4,6,8 with 1st (S) yarn. 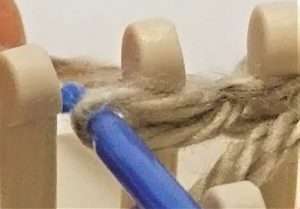 Work peg 7 with 1st (R) yarn. Lay yarns down. Work row with (A) yarn in stockinette skipping all pegs with colors. Row 34: Work pegs 5 & 7 with (S) yarn. Work pegs 8 & 9 with (R) yarn. 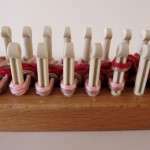 Work pegs 24 & 25 witj (R) yarn and work pegs 26 & 28 with (S) yarn. Lay down all short yarns. Work row in stockinette with (A) yarn on all stitches not covered with colors. Hook over. Row 35: Work pegs 6 & 8 with (S) and peg 9 with (R) yarn. 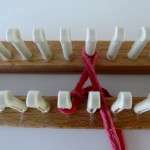 Work peg 23 with (R) and pegs 24-25 & 27 with (S) yarns. Work row in stockinette with (A) yarn on all stitches not covered with colors. Hook over. Cut and knot both (R) yarns as they will not be used any further. Row 36: Work pegs 5 & 7 with (S) yarn. Work pegs 23 & 26 with (S) yarn. Work row in stockinette with (A) yarn on all stitches not covered with colors. Hook over. Cut and knot 1st (S) color as it will not be used again. Row 37: Work pegs 24-25 & 27 with (S) yarn b/b weave. Work row in stockinette with (A) yarn on all stitches skipping the pegs with color. Hook over. Cut and knot the last (S) yarn. Rows 38-40: Work rows in (A) yarn in stockinette and hook over. Bind off with basic 2- loop method. Weave in yarn tails. Bind off at anchor yarn with basic 2-loop method or if this is beginning of a scarf or other garment, continue with your choice of colors. BACK TO BACK WEAVE: Demonstrated with the white yarn. The red yarn is worked in stockinette. 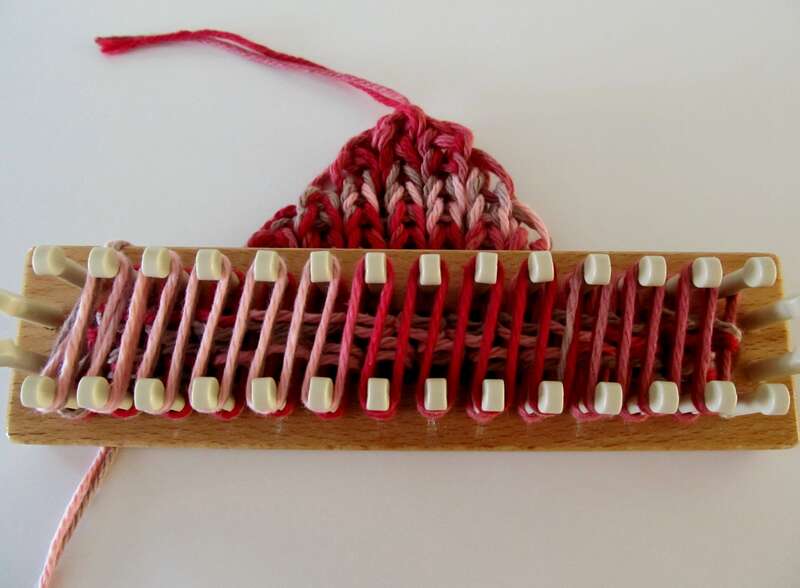 This basic weave allows for color stitches to be completed in just one pass on the loom. I’m just loving all of these! That’s great, as we have more coming. Enjoy the season. Loom Knitting Advent Day 5 brings you easy, quick, and fun bead tree ornaments! Chain cast on 3 pegs. Repeat rows 1 – 2 until ribbon is approximately 21″ long. Fold the knit ribbon starting with the bottom 3″ wide. Continue to fold with each branch narrower than the one below. Place the beads between each branch of the ribbon. Thread the beading needle with the crochet thread. Thread 1 strand of the thread through the smallest bead at the bottom as an anchor. and through the middle of the ribbon. 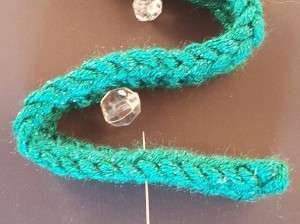 Continue threading the crochet thread through the next bead and then through the middle of the next branch until all is strung. Thread last bead on top and knot above the top bead. 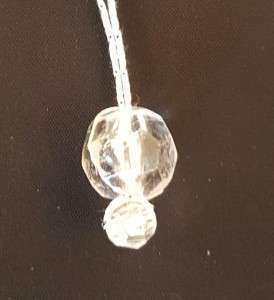 Make hanger by making another knot about 2″ above the top bead, string 1 last bead, and knot thread above the bead. What a great idea Renita. They are soo adorable! Quick and easy to make too! 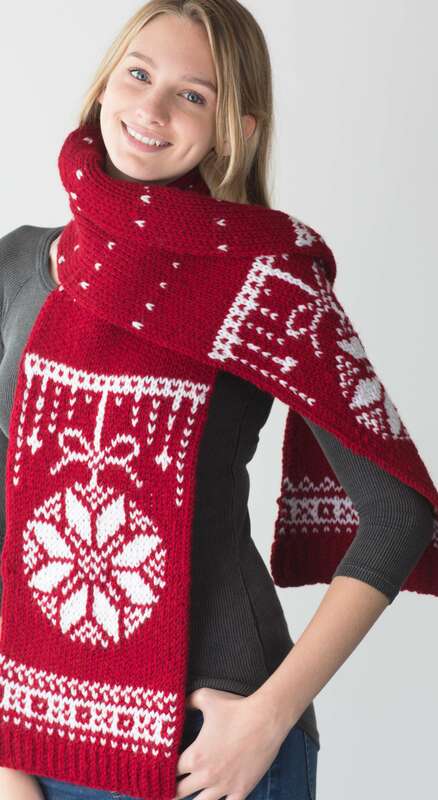 Let’s bring in the holidays with a beautiful double knit scarf, perfect for the chilly weather! 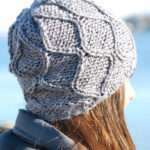 Its beautiful design will have you reaching for your knitting loom and casting on. 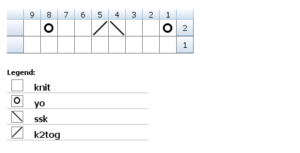 Pattern notes: You may want to number your pegs as it is a little easier to follow the chart. 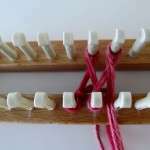 To mark the loom, lay painter’s masking tape along the wood next to the pegs on both boards. Use a fine-point pen or Sharpie and just number from 1 to 35 for the width of scarf. Work the scarf in the center of the knitting board rather than at the ends. 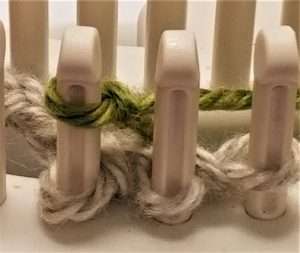 Always wrap the pegs with the (W) yarn first. This creates the pattern. 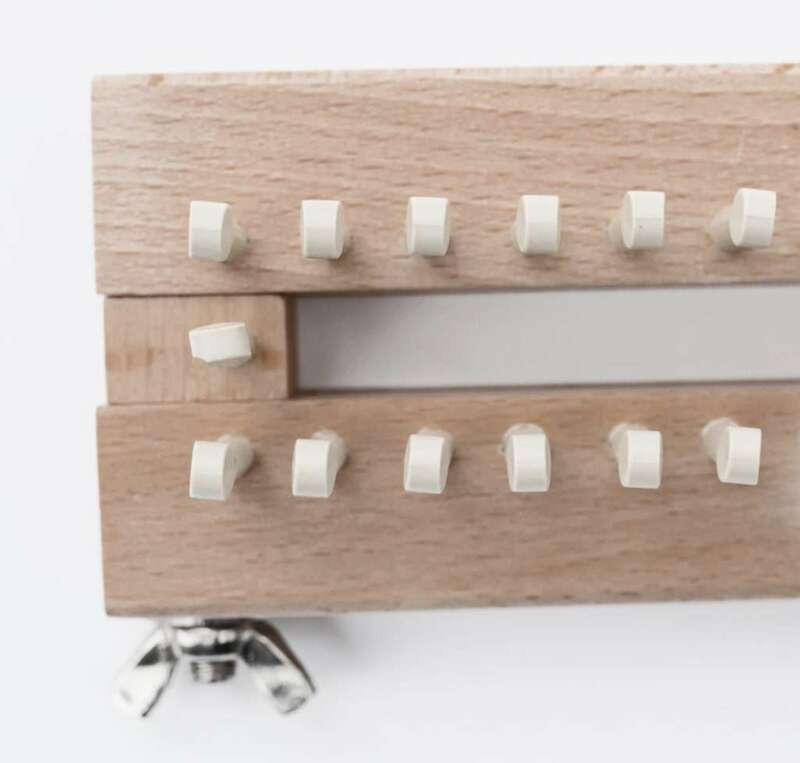 Then you will fill in all the rest of the pegs that were not wrapped using (C). Work the chart from bottom, and work up the scarf. Print a copy of the pattern. After completing each row, draw line thru the row, or fold over the pattern paper so that the current row is easy to see. Written instructions are also included. Back-to-back weave: This is an easy way to work stitches that are just a few in number within a row. When you are working in stockinette for the main color of each row, the extra color stitches may be worked with a single pass. Similar to working in Figure8, only without the twist of the ‘8’. So wrap the yarn around both pegs of the stitch, front to back, going straight across the boards. This can also add a bit of highlight effect to stitches. In this pattern, it is used to simplify with just a single pass rather than doing the stockinette weave. See photo at end of pattern. Cast on 35 stitches with (C) in Stockinette stitch, using anchor yarn of a contrasting color. It will be removed. Rows 1 – 7: Work in Rib stitch. Row 8: Work in Stockinette stitch. Row 9: Tie on (W) yarn and wrap the stitches in back- to- back weave. This will be on stitches 2, 4, 6, 8, 10, 12, 14, 16, 18, 20, 22, 24, 26, 28, 30, 32, and 34. Each stitch will be wrapped on front and back pegs. Weave (C) yarn on all the remaining pegs in stockinette, skipping the pegs where you have placed the (W) yarn. Hook over. Do not cut the (W) yarn. Row 10: Weave stockinette stitch on all pegs in (C). Just carry the (W) yarn through the center of the board; no need to tie off until after row 19. Row 11: Weave (W) on rows 2 to 34 in stockinette. Weave in (C), back-to-back on peg 1 and loosely carry the yarn to peg 35. Hook over. Row 12: In basic, work (W) yarn on both sides of the pegs for 4, 6, 8, 12, 14, 16, 20, 22, 24, 28, 30, and 32. Wrap (C) yarn in stockinette on all the pegs not wrapped in (W). Hook over. Row 13: Work (W) in basic on pegs 2, 4, 5, 7, 8, 10, 12, 13, 15, 16, 18, 20 21 23, 24, 26 28, 29 31, 32, and 34. Wrap (C) on all the remaining pegs and hook over. Row 14: In basic, work (W) yarn on both sides of the pegs for 4, 6, 8, 12, 14, 16, 20, 22, 24, 28, 30, and 32. Weave (C) yarn in stockinette not wrapped in (W) and hook over. Row 15: Weave (W) on rows 2 to 34 in stockinette. 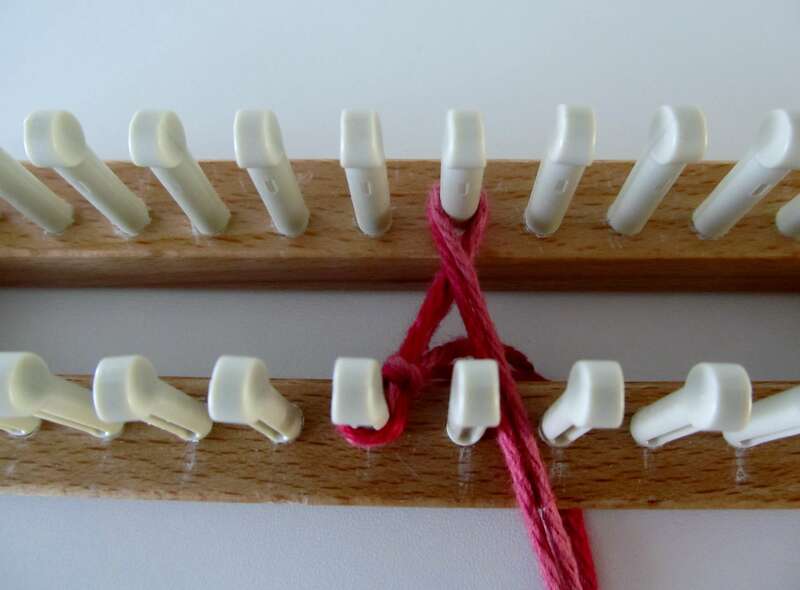 Wrap back-to-back on peg 35 than loosely carry the yarn to peg 1 in (C). Hook over. Row 16: Work row in (C) yarn in stockinette stitch, leaving (W) yarn attached. Hook over. Row 17: Work in (W) yarn in basic weave on pegs 2, 4, 6, 8, 10, 12, 14, 16, 18, 20, 22, 24, 26, 28, 30, 32, and 34. Wrap (C) on all the remaining pegs in stockinette skipping the pegs where you have placed the (W) yarn. Hook over. Row 18: Wrap (W) in basic on pegs 3, 5, 7, 9, 11, 13, 15, 17, 19, 21, 23, 25, 27, 29, 31, and 33. Wrap (C) on all the remaining pegs in stockinette skipping the pegs where you have placed the (W) yarn. Hook over. 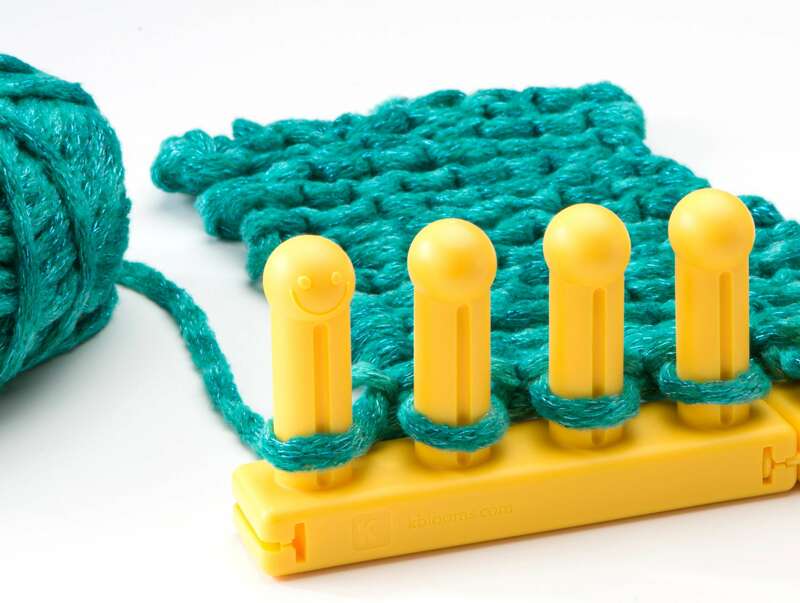 Row 19: Wrap (W) in basic on pegs 2, 6, 10, 14, 18, 22, 26, 30, and 34. Wrap (C) on all the remaining pegs in stockinette skipping the pegs where you have placed the (W) yarn. Hook over. 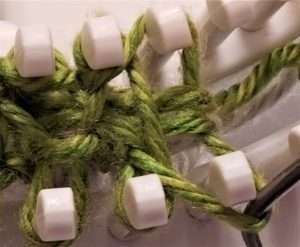 Tie and knot the (W) yarn in between your pegs leaving a 5” yarn tail. Rows 20-26: Work 7 rows in stockinette with (C) yarn. Row 27: Tie on (W) in the center of the knitting near peg 17. 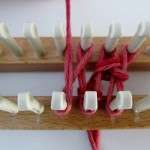 Work pegs 15, 17, 19, and 21 in (W) in basic weave. Work the remaining pegs in (C). Hook over. Row 28: Work pegs 13, 16, 20, and 23 in (W) in basic weave. Work all remaining pegs in (C). Hook over. Row 29: Work pegs 11, 13, 14, 17, 19 22, 23, and 25 in (W) in basic. Work the remaining pegs in (C) and hook over. Row 30: Work pegs 10, 13, 14, 15, 18, 21, 22, 23, and 26 in (W) in basic. Work the rest in (C) and hook over. Row 31: Work pegs 9, 11, 13, 14, 15, 16, 20 21, 22, 23, 25, and 27 in (W) in basic. Work the rest in (C) and hook over. 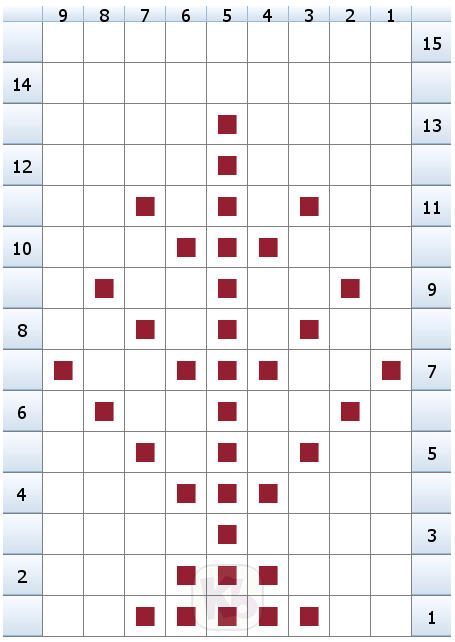 Row 32: Work pegs 8, 10, 13, 14, 15, 16, 17, 19, 20, 21, 22, 23, 26, and 28 in (W) in basic. Wrap the rest in (C) and hook over. Row 33: Work pegs 7, 9, 11, 14, 15, 16, 17, 19, 20, 21, 22, 25, 27, and 29 in (W) in basic. Work the rest in (C) and hook over. Row 34: Work pegs 15, 16, 17, 19, 20, and 21 in (W) in basic. Wrap the rest in (C) and hook over. Row 35: Work pegs 6, 7, 8, 9, 10, 13, 16, 17, 19, 20, 21, 23, 26, 27, 28, 29 and 30 in (W) in basic. Work the rest in (C) and hook over. 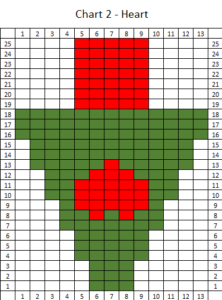 Row 36: Work pegs 7, 8, 9, 10, 13, 14, 17, 19, 22, 25, 26, 27, 28, and 29 in (W). Work the rest in (C) and hook over. Row 37: Work pegs 5, 8, 9, 10, 11, 12 15, 21, 24, 25, 26, 27, 28 and 31 in (W). Work the rest in (C) and hook over. 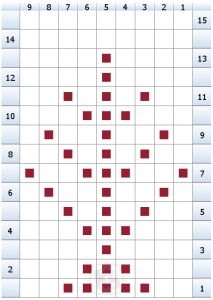 Row 38: Work pegs 6, 9, 10, 11, 12, 13, 16, 18, 20, 23, 24, 25, 26, 27 and 30 in (W). Work the rest in (C) and hook over. Row 39: Work pegs 5, 7, 9, 10, 11, 12, 13, 14, 17, 19, 22, 23, 24, 25, 26, 29 and 31 in (W). Work the rest in (C) and hook over. Row 40: Work pegs 6, 8, 16, 18, 20, 28 and 30 in (W). Work the rest in (C) yarn and hook over. Row 71: 2, 4, 6, 8, 10, 12, 14, 16, 18, 20, 22, 24, 26, 28, 30, 32, and 34. Tie (W) yarn and cut. Rows 73-83: Work 11 rows in stockinette stitch, (C) yarn. Row 84: Tie (W) yarn near peg 4. Work pegs 4, 8, 12, 16, 20, 24, 28, and 32 in basic. Work all other pegs in (C). Hook over. Tie (W) yarn and cut. Rows 85-95: Work 11 rows in stockinette stitch in (C) yarn. Row 96: Tie on (W) yarn near peg 6. Work pegs 6, 10, 14, 18, 22, 26, and 30 in basic. Wrap all other pegs in (C). Hook over and tie (W) yarn and cut. Rows 97-107: Work 11 rows in stockinette stitch, (C) yarn. Row 108: Repeat Row 84. Rows 109 – 119: Work 11 rows in stockinette with (C) yarn. Row 120: Repeat row 96. Rows 121 – 131: Work 11 rows in stockinette stitch, (C) yarn. Row 132: Repeat row 84. Rows 133 – 143: Work 11 rows in stockinette stitch, (C) yarn. Row 144: Repeat row 96. Rows 145 – 155: Work 11 rows in stockinette, (C) yarn. Row 156: Repeat row 84. Rows 157 – 167: Work 11 rows in stockinette, (C) yarn. Row 168: Repeat row 96. Rows 169 – 179: Work 11 rows in stockinette, (C) yarn. Row 180: Repeat row 84. Rows 181 – 191: Work 11 rows in stockinette, (C) yarn. NOTE: If you want your scarf shorter or longer, this would be the place to make adjustments. Take one or more rows of the solid Stockinette out to make the scarf shorter, or add one or more rows in between the “stars” to make it longer. 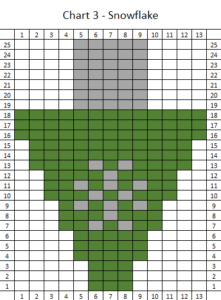 The scarf is a mirror image so that you can take the pattern upside down if you’re using the chart. Row 192: Repeat row 72. Row 193: Repeat row 71. Row 194: Repeat row 70. Row 195: Repeat row 69. Rows 196-255: Continue to repeat the rows in reverse. It will probably be exceedingly easier to use the chart and check off each row as you go. Row 256: Work 1 row in stockinette, (C) yarn. Rows 257 – 263: Work in rib stitch. Row 264: Work 1 row in stockinette, (C) yarn. Bind off loosely and finish ends with crochet hook in 2-loop method. Remove anchor yarn. Weave in ends and yarn tails. Enjoy the holiday season in this gorgeous and warm scarf! Back to back weave in photo. When working in stockinette, and the pattern calls for a few stitches in back to back, we just weave the yarn around back peg and straight down to front peg, of one stitch. This results in a single pass simplifying the change of colors. In this photo, the red yarn is done in Stockinette and the white yarn is done in back-to-back weave or basic weave. 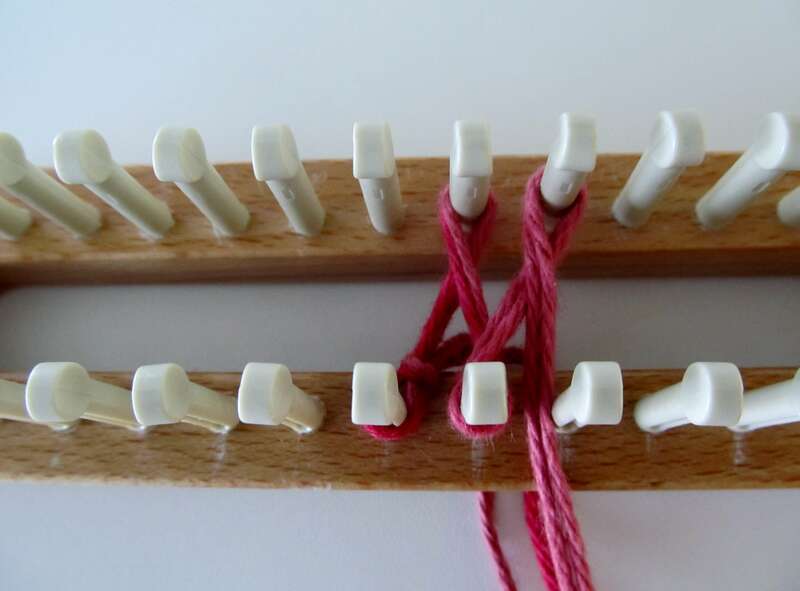 This is an easy way to adjust the pegs to be wrapped in each row. Beautiful! Do we get to know the very talented designers, or will they be kept a mystery? The scarf is very lovely, congratulations to the designer. Thank you Sue for pointing that out. We will add the names of the designers, they are all part of the KB Team. The Celebration Scarf was designed by the talented, double knit guru, Jacquelyn Darragh. On Facebook some one asked what the back to back weave is. Does it mean make the pattern white pegs done first in stockinette and then come back on all skipped pegs in red with the stockinette wrap? Could you explain it in the comments. I had not heard it called ‘weave’ before either. Beautiful! 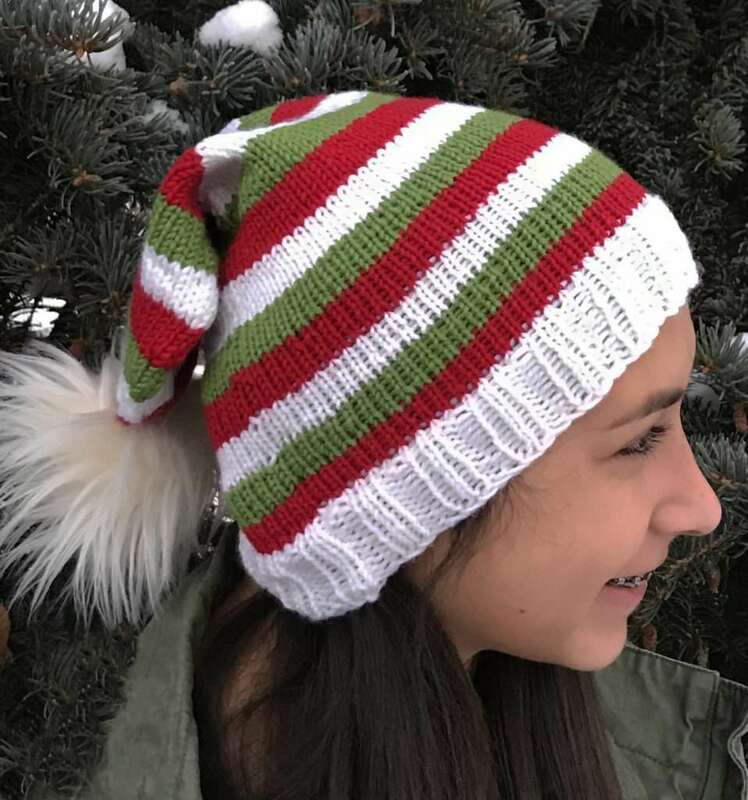 Thank you so much for the pattern — it truly is lovely and I can’t wait to try it! Can you please explain what is meant by “wrap the stitches in a back-to-back weave” in row 9? Thank you so much. Hi ! but I don’t know what they mean with “back to back” or “basic weave”. Can’t find an explanation anywhere. Can anybody explain this? 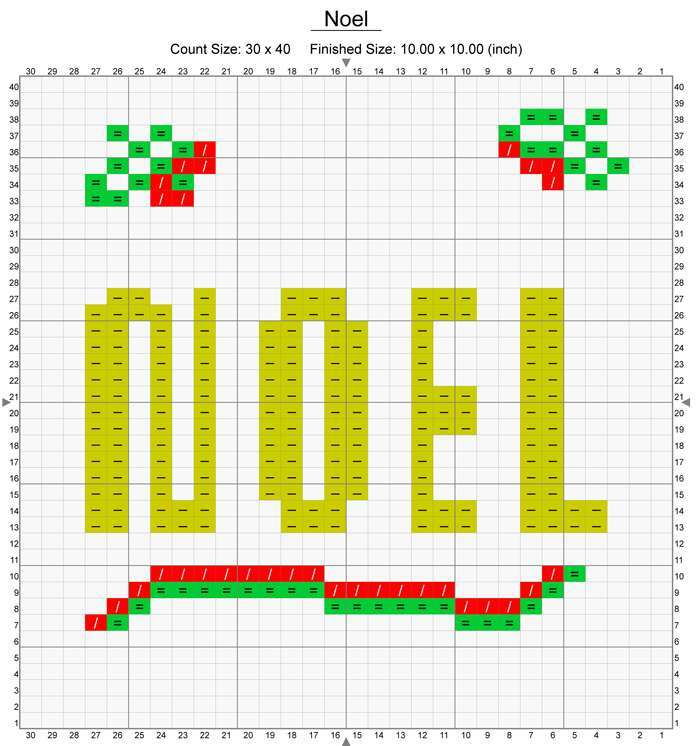 Hi, the instruction for the back to back weave has been added to the pattern for the holiday scarf. But it is worked like a Figure8 without the twist. 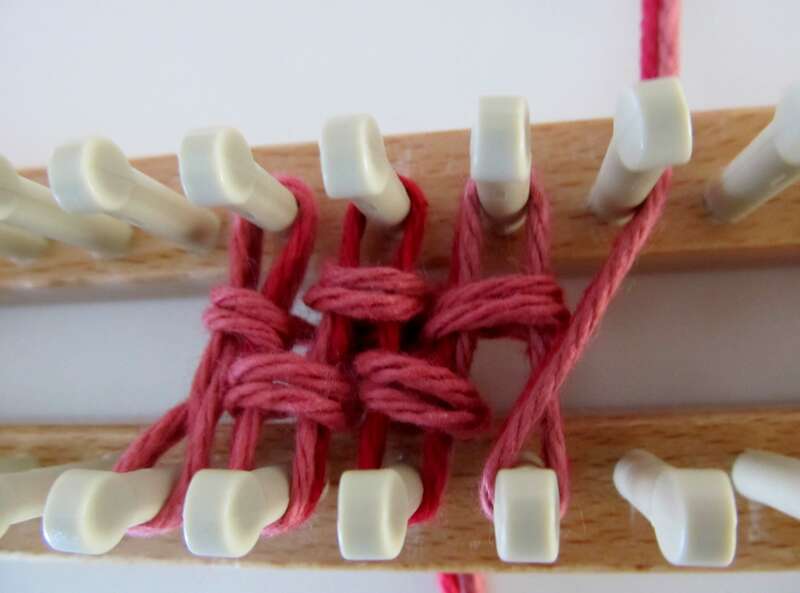 Just weave both pegs of a double stitch by wrapping the yarn, straight across around both pegs. It was used to simplify the color stitches when there were just a few in each row. I am very much a beginner. When doing the rib stitch for the first rows I have 2 rows at end rather than one. Do I just wrap 34 individually and then start back from 35 to 33? Hi, Usually when doing the rib stitch, we use an even amount of stitches. However, this is not always required especially when you are doing just a few rows before beginning a design. In the case of this beautiful scarf, the design of the Christmas balls and ribbons was the primary goal. So, you start the rib stitch on peg 1 top to peg 3 bottom and work across the pegs. When you get to the end of the row, you are taking the yarn from top peg 33 to bottom peg 35. Wrap around and go back up to peg top 35. Wrap pegs 34 top and bottom, and then continue the rib stitch, back to beginning. The stockings were hung, the music is playing, the food is cooking, and you are surrounded by all your loved ones. 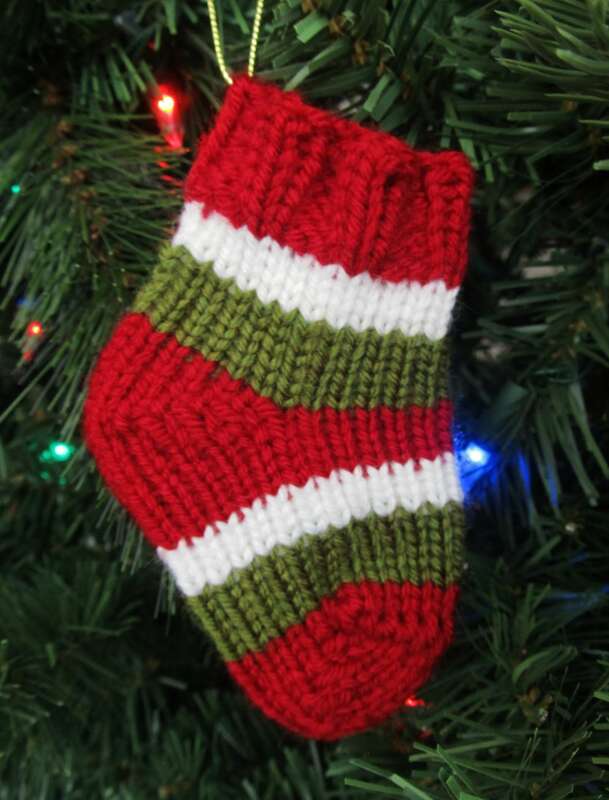 Knit your loved ones an heirloom stocking that they will be honored to display. 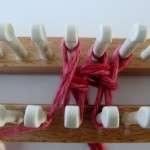 Knitting Loom: (4) Zippys, (4) Corners, 20 pegs. W&T=Wrap and Turn. 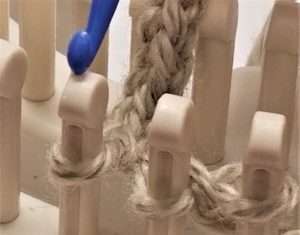 Lift the loop that is currently on the peg, wrap the peg with the working yarn by taking the working yarn to the inside of the loom, then wrapping around the peg so the working yarn ends to the front of the peg, place the loop back on the peg). Use 2 strands throughout the project. Cast on 20 sts, prepare to work in the round. Rnd 2: *p1, k1; rep from * to end of rnd. Rnd 3: *k1, p1; rep from * to end of rnd. Rnd 4: *p1, k1; rep from * to end of rnd. Rnd 5-24: k to the end of rnd. 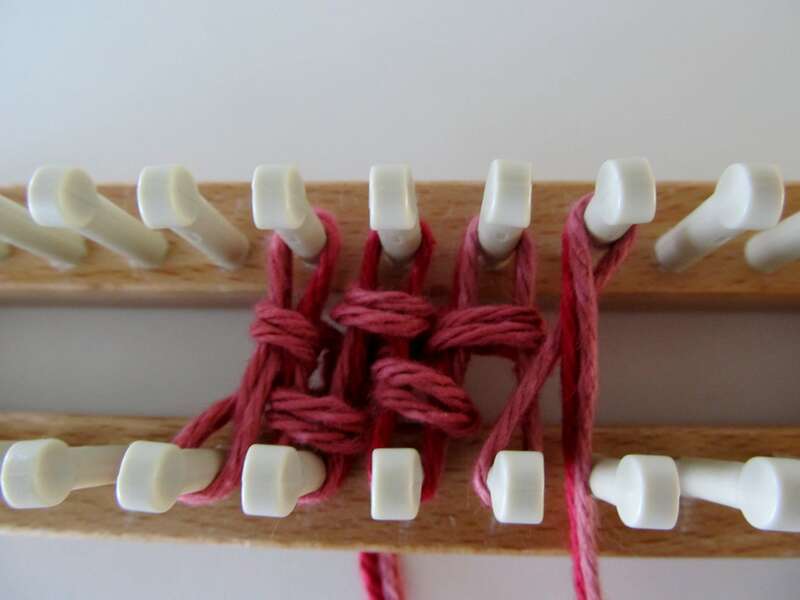 Heel: Worked as short-rows over the first 10 pegs. *Row 1: Knit from peg 1-9, W&T peg 10. Row 2: Knit from peg 9 to peg 2, W&T peg 1. Row 3: Knit from peg 2 to peg 8, W&T peg 9. Row 4: Knit from peg 8 to peg 3, W&T peg 2. Row 5: Knit from peg 3 to peg 7, W&T peg 8. Row 6: Knit from peg 7 to peg 4, W&T peg 3. Row 7: Knit from peg 4 to peg 8 (lift all the loops on peg 8 as one loop). Row 8: Knit from peg 7 to peg 3 (lift all the loops on peg 3 as one loop). Row 9: Knit from peg 4 to peg 9 (lift all the loops on peg 9 as one loop). Row 10: Knit from peg 8 to peg 2 (lift all the loops on peg 2 as one loop). Row 11: Knit from peg 3 to peg 10 (lift all the loops on peg 10 as one loop). W&T peg 11. Heel complete: work in the round from this point forward. Next 12 rnds: k to the end of rnd. Lift bottommost loop off peg 11 and peg 20. Transfer stitches to knitting needles and close toe with the Kitchener Stitch. 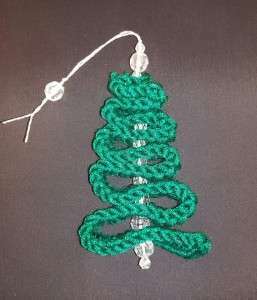 Using contrasting color yarn and the double stitch technique, embroider the tree over the center 9 stitches of the side of the leg. 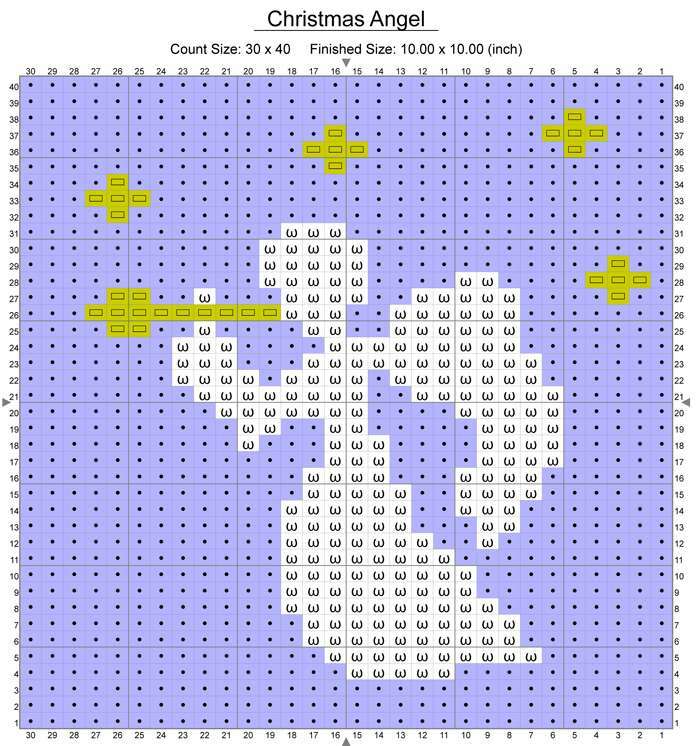 Chart shows the 9 stitches and 15 rows that it covers. 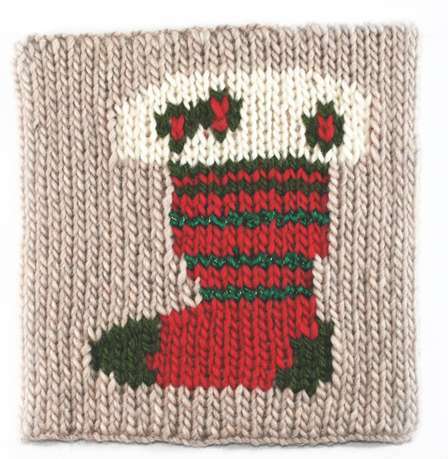 This is just the cutest stocking ever! I don’t have Zippy yet, so I’m going to have to get on board. This also looks like you could just whip some of these darling’s up for my mantel, friends and shut-ins for a really special holiday treat. What great idea! Thank you Jacquelyn! It was a speedy project and so much fun to play with double stitching technique. What does the abbreviation md stand for. Is there a video on the wrap and turn, I just can’t visualize it. I love the stocking, it is beautiful! Robin, where is the md abbreviation? I can’t find it.